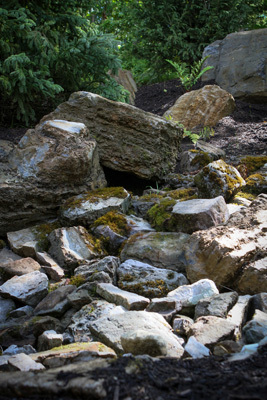 Receive news about our latest projects, photos and more! 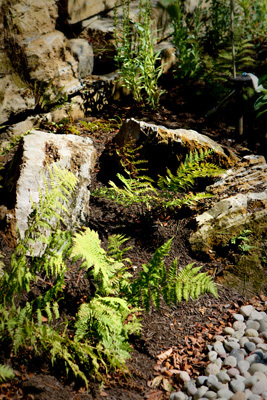 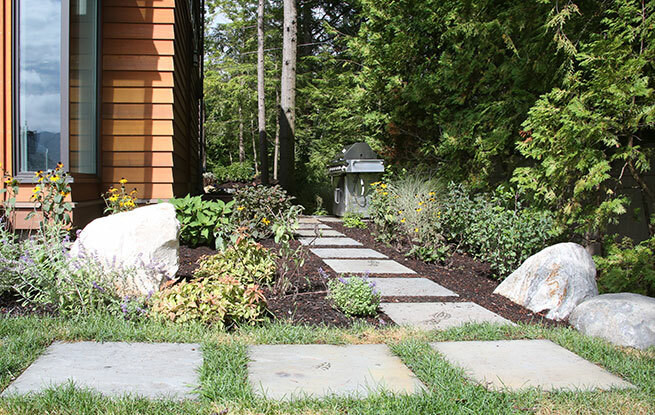 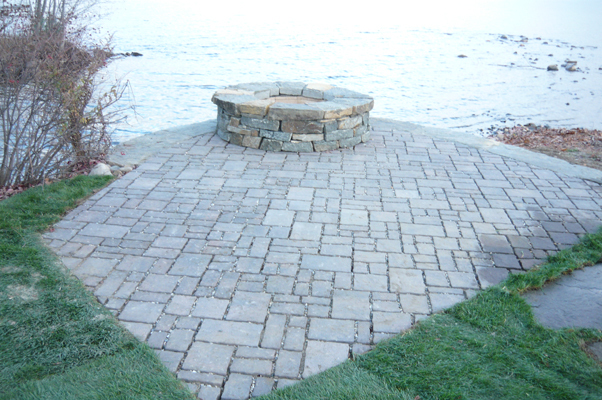 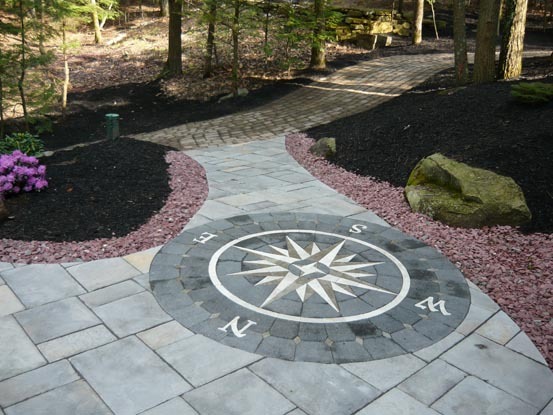 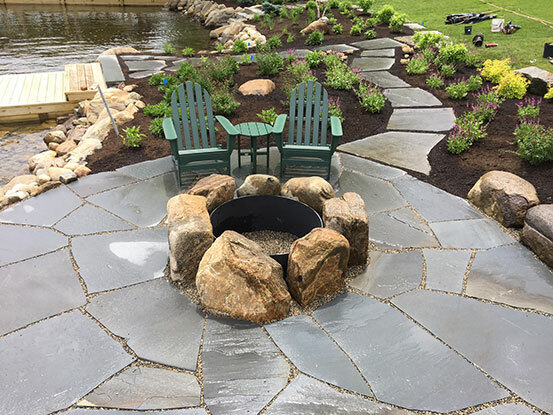 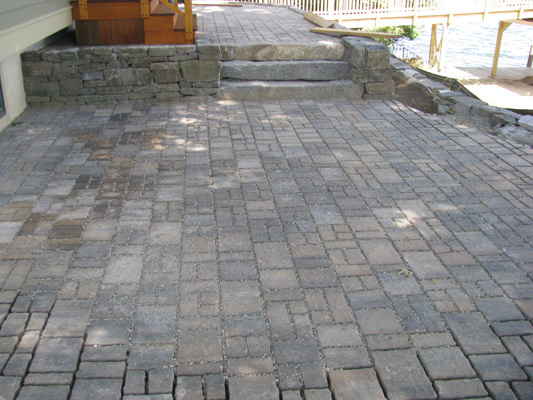 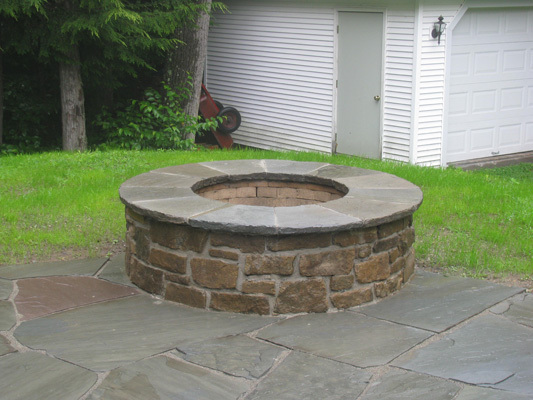 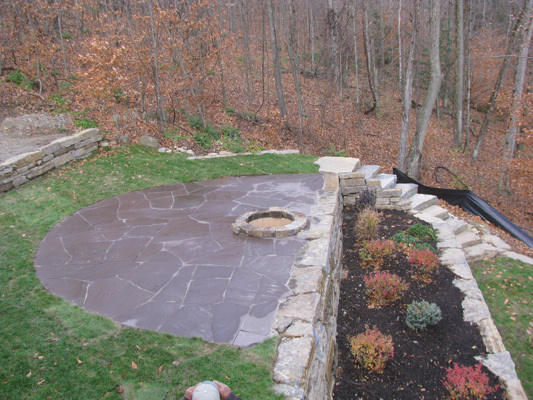 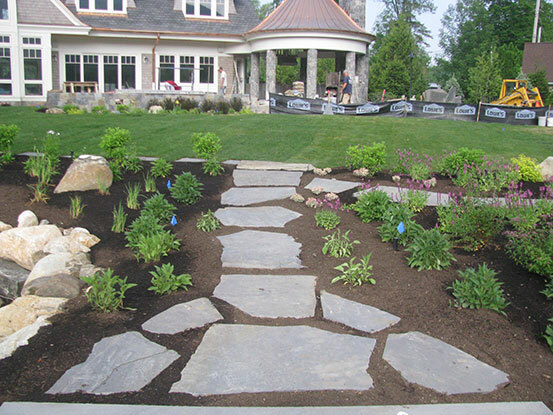 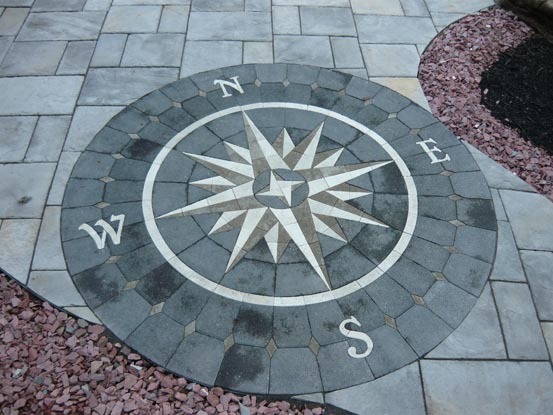 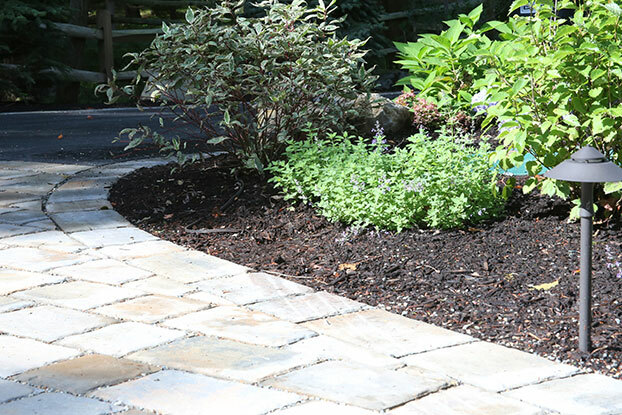 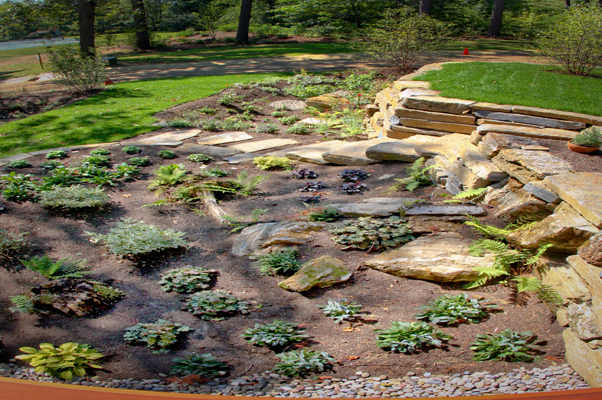 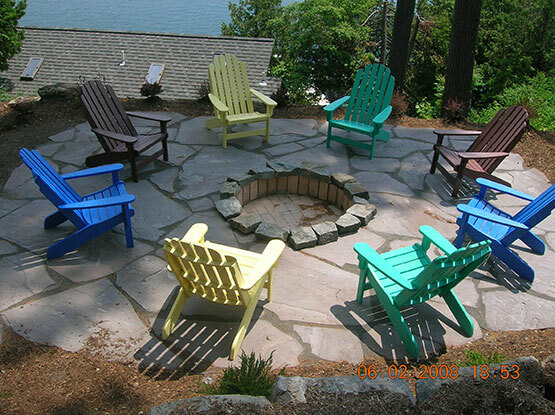 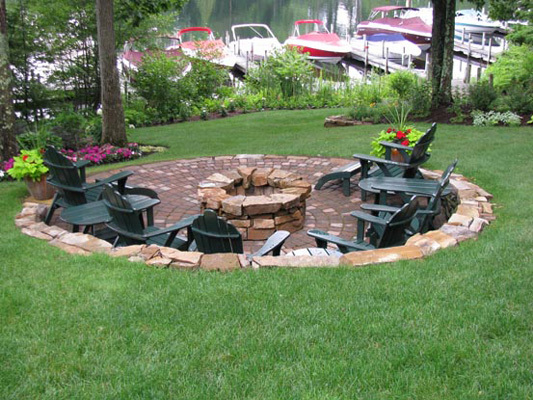 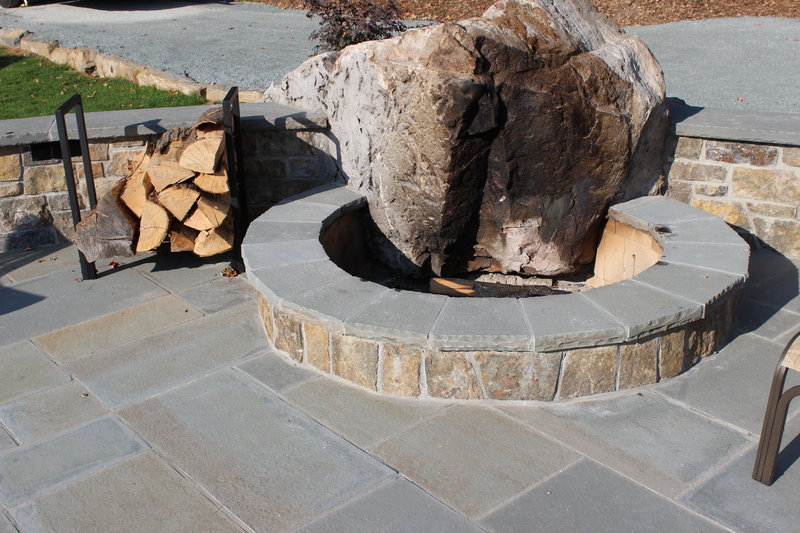 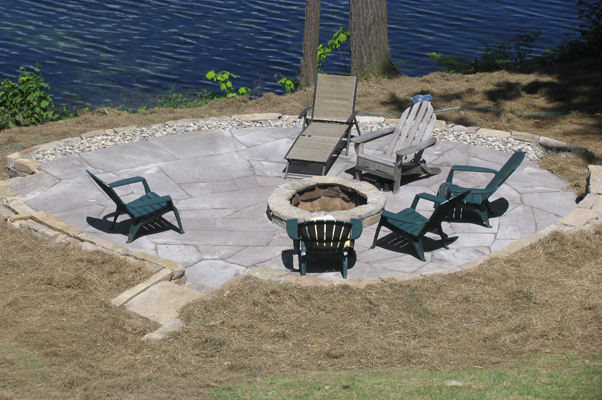 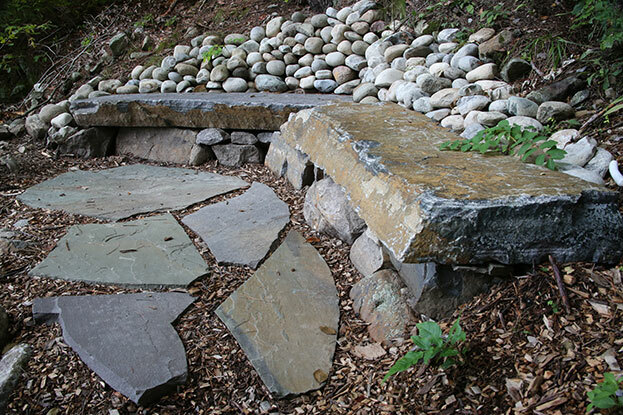 Our hardscape features can be built on both large and small scale projects ranging from small backyard patios and fire pits, to large scale retaining walls and driveways. 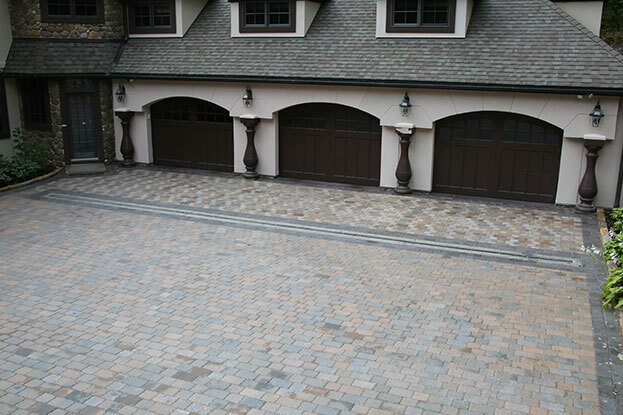 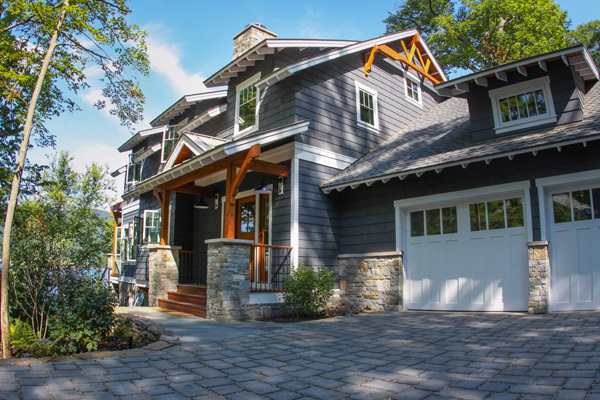 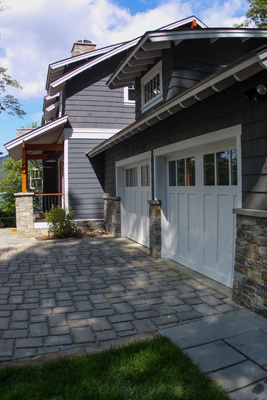 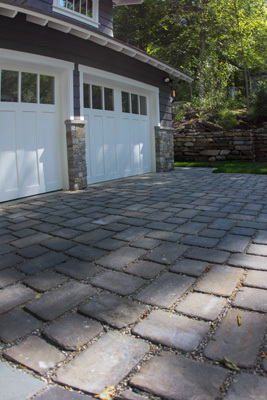 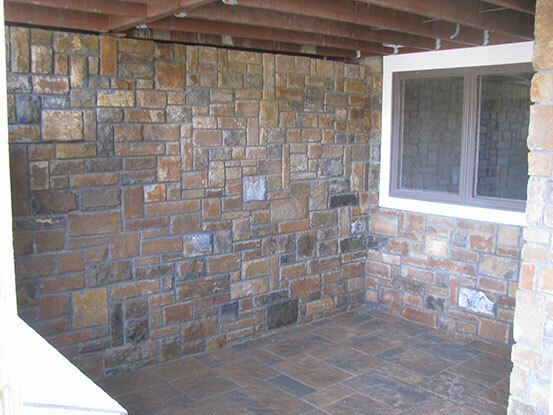 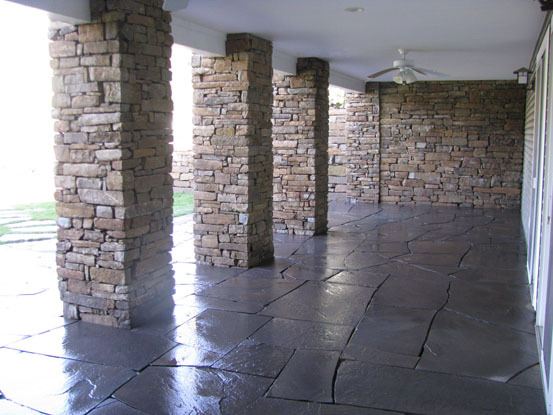 We build with most all types of stone materials such as pre-cast concrete pavers and wall block that comes in several different sizes, colors and textures. 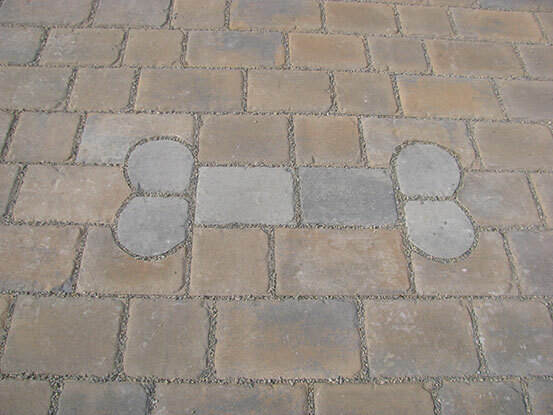 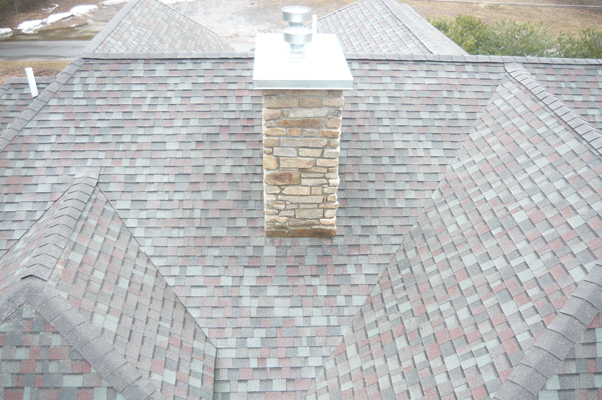 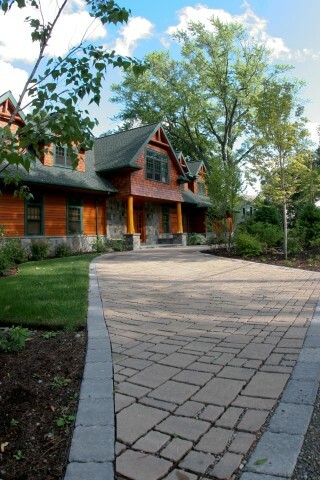 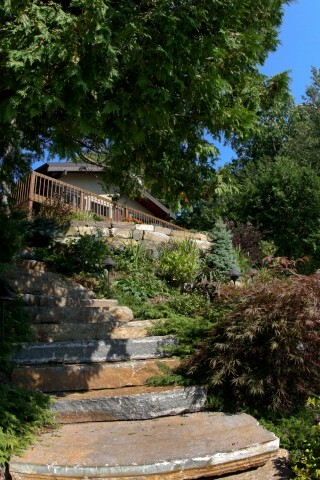 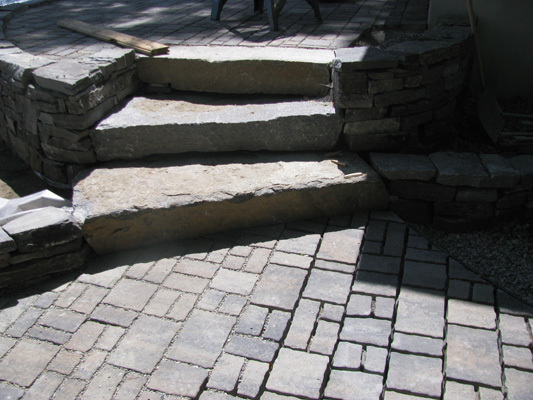 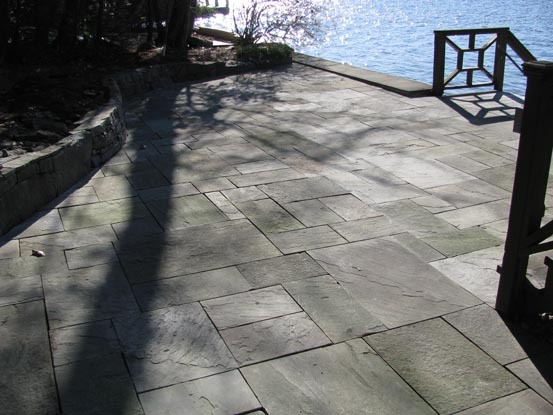 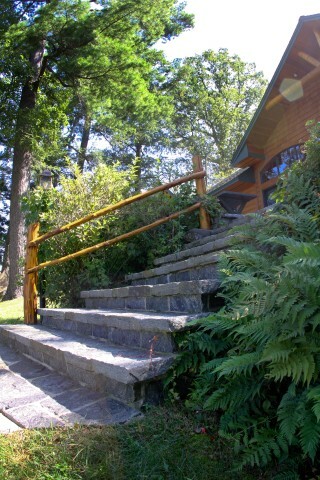 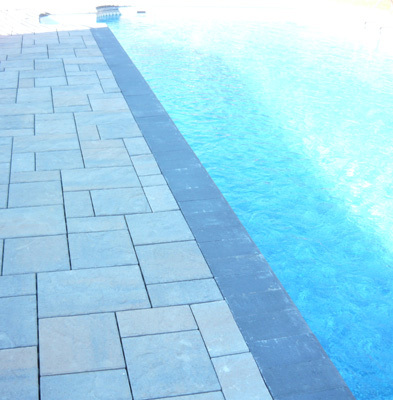 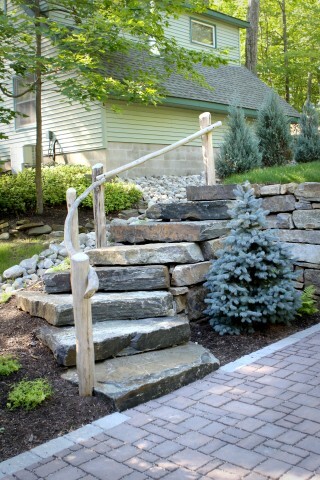 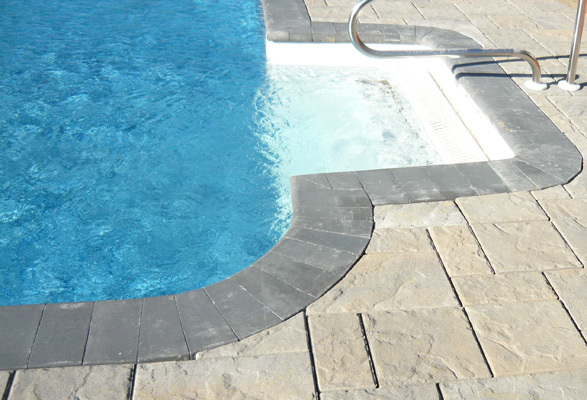 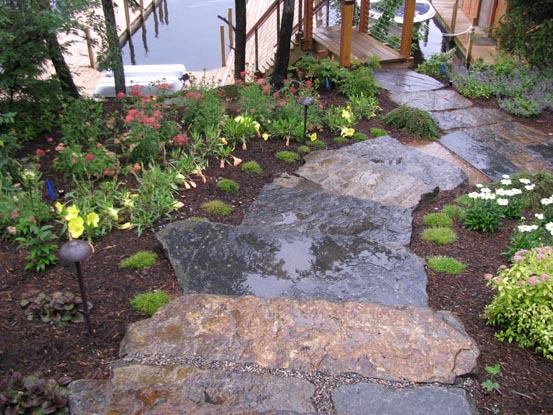 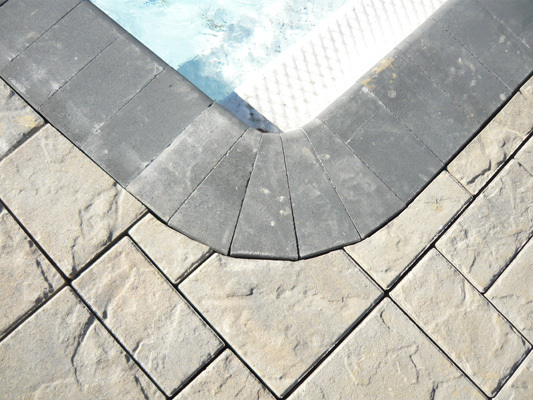 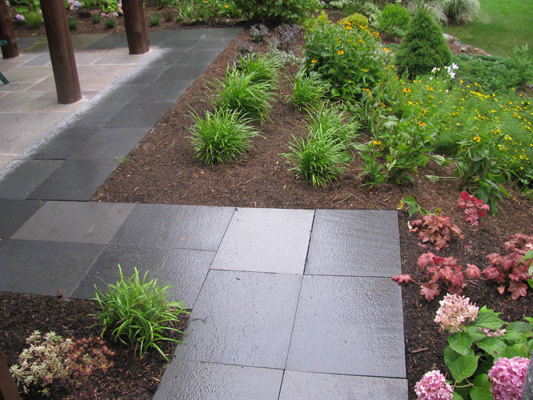 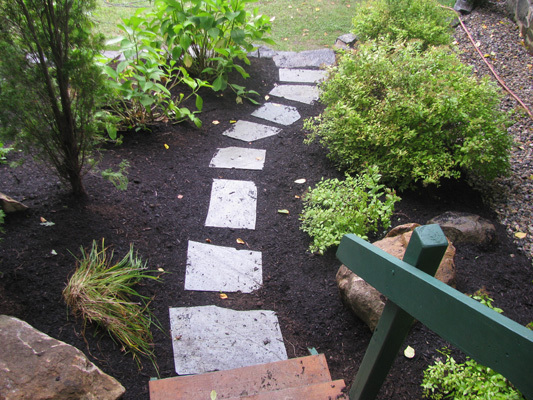 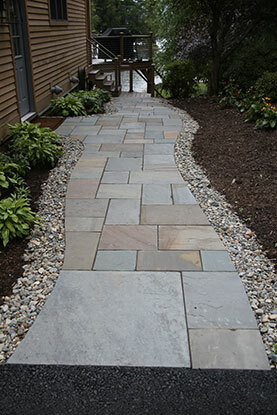 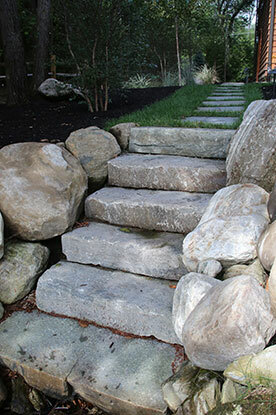 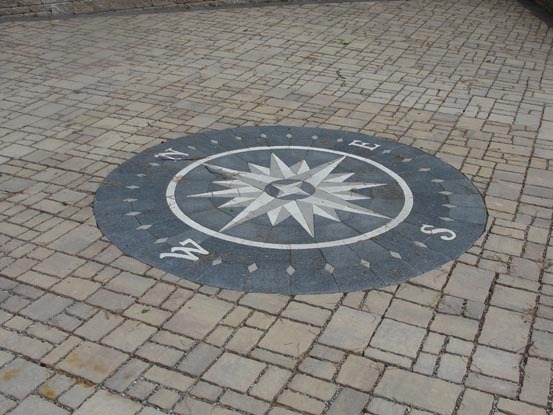 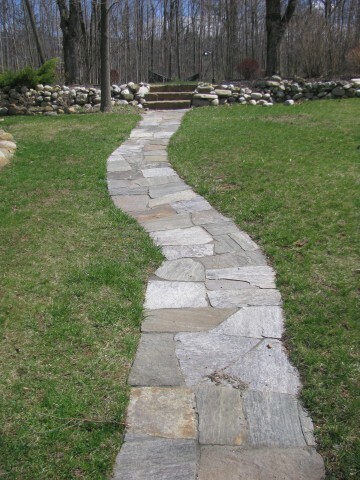 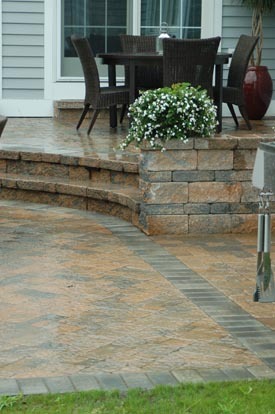 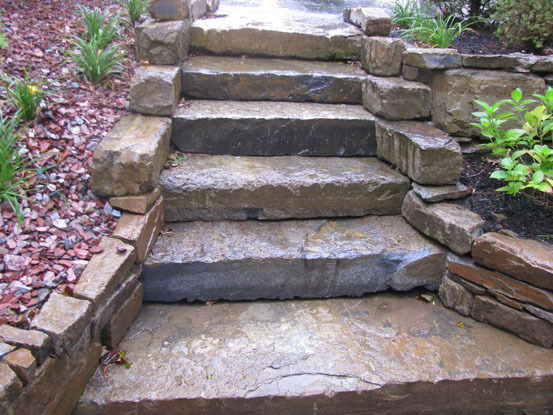 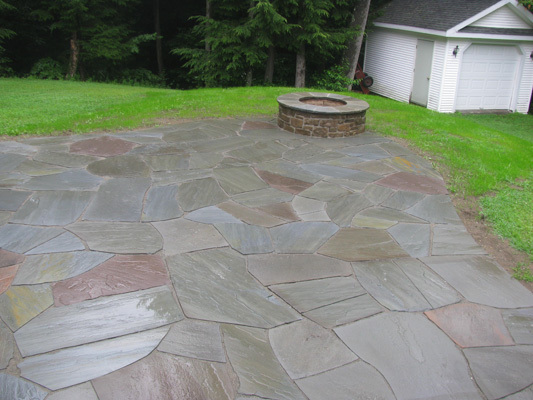 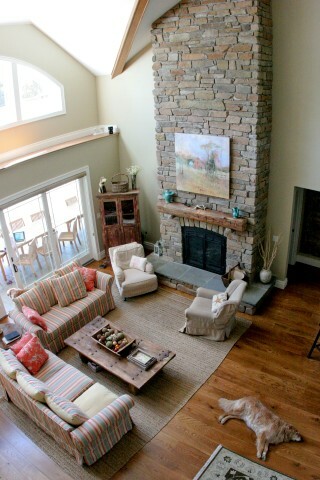 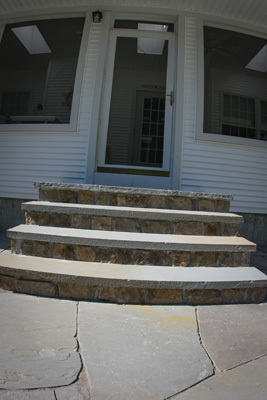 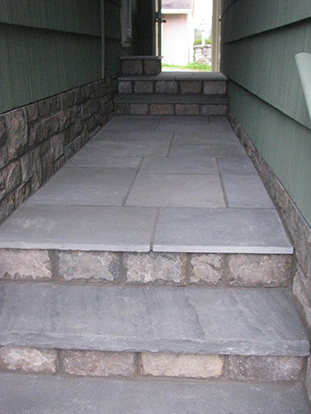 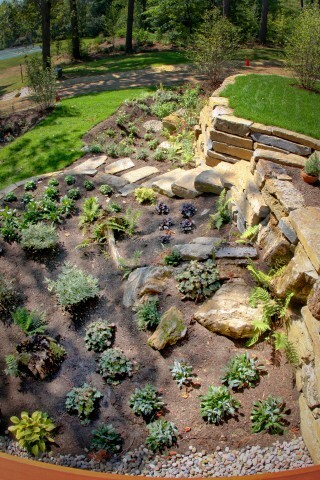 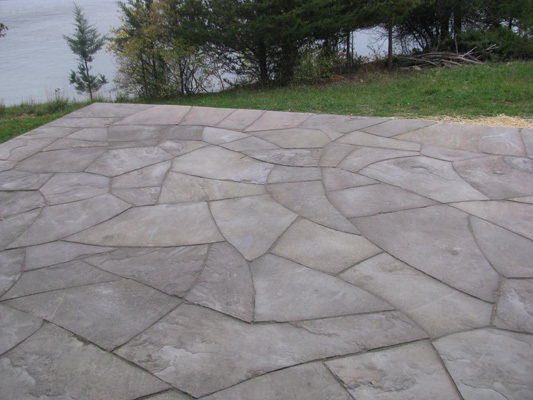 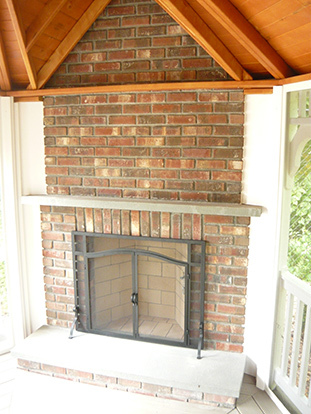 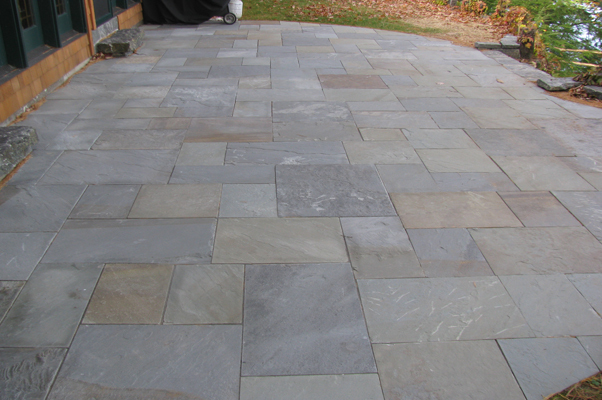 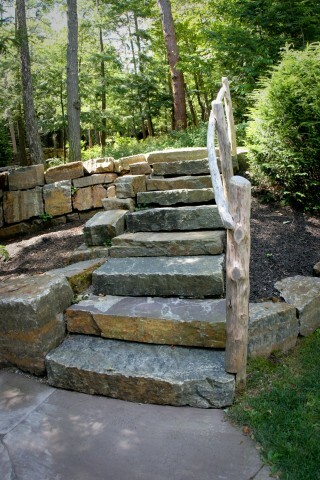 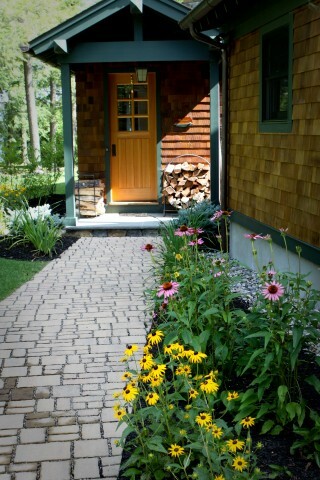 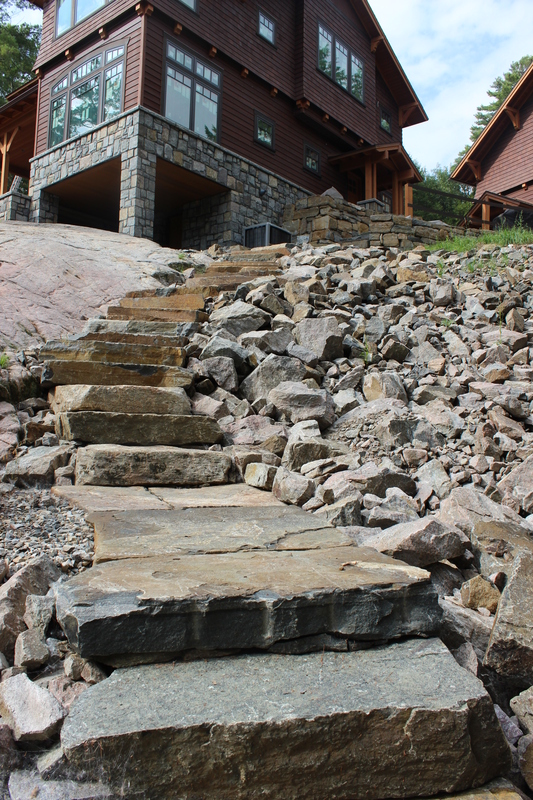 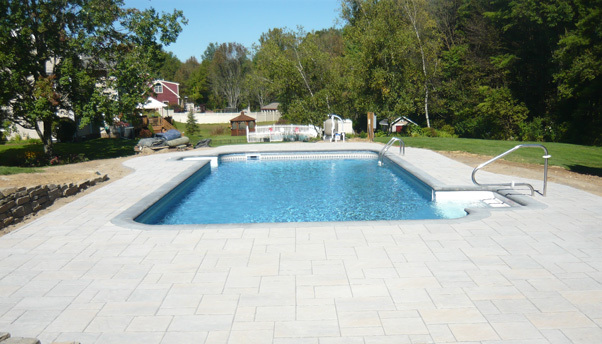 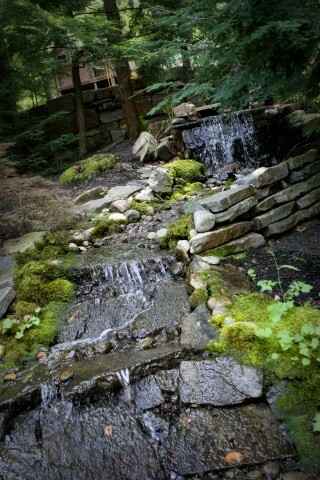 We also use irregular cut flagstone, granite, Belgian block, cobble, river washed flat stone and limestone. 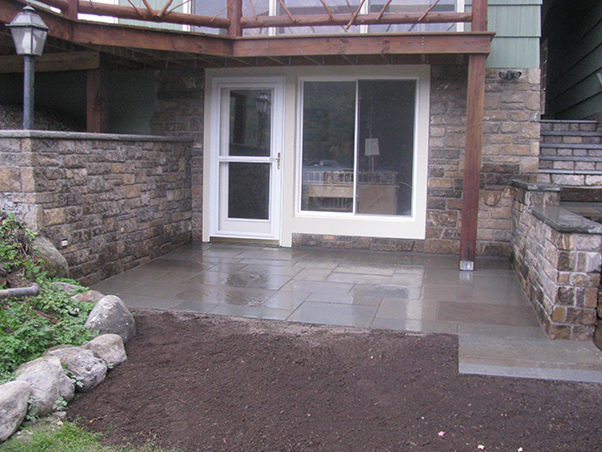 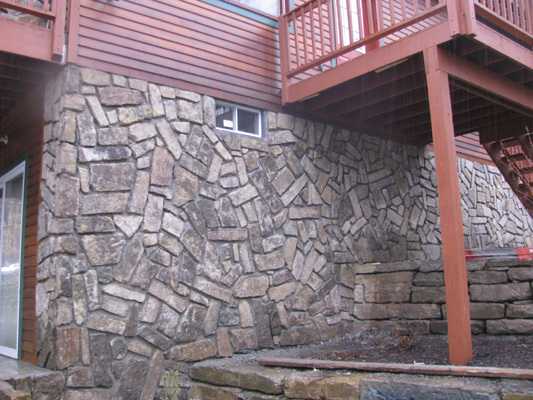 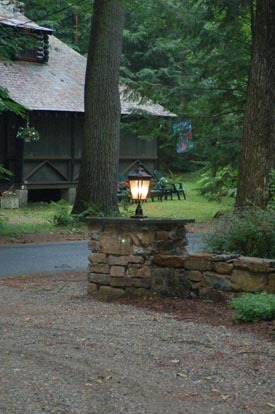 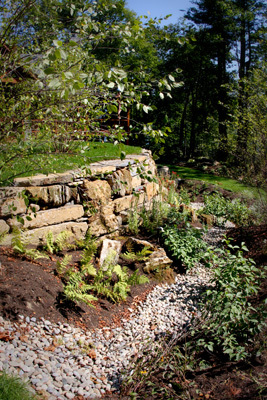 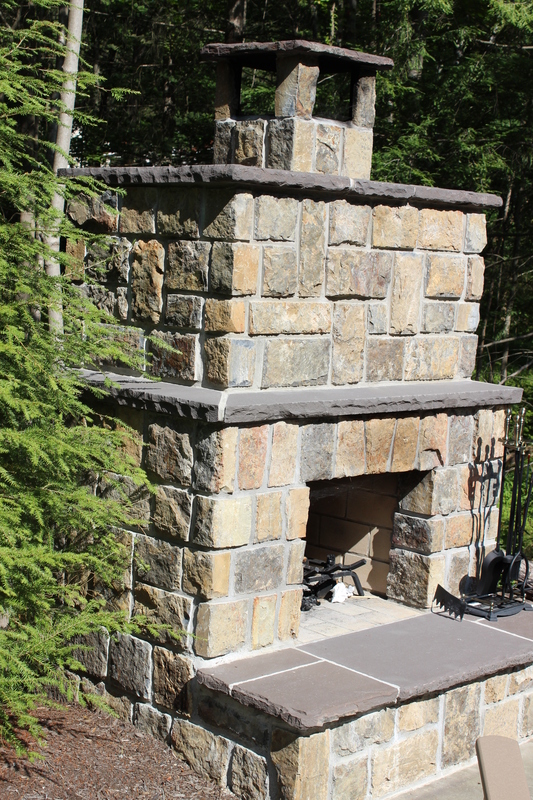 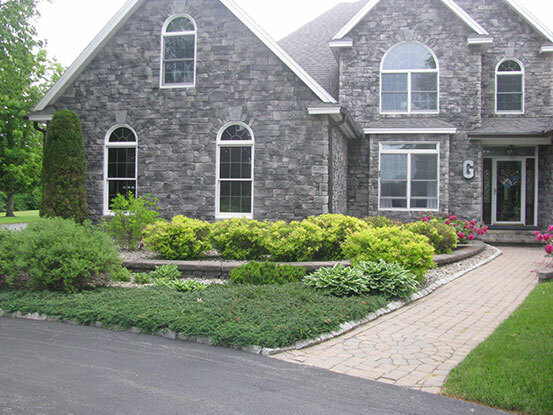 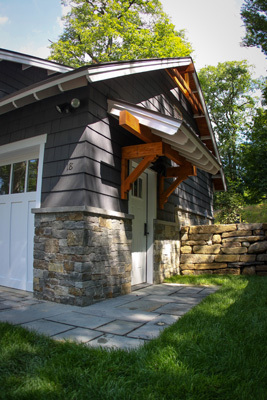 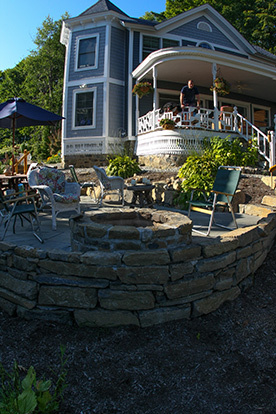 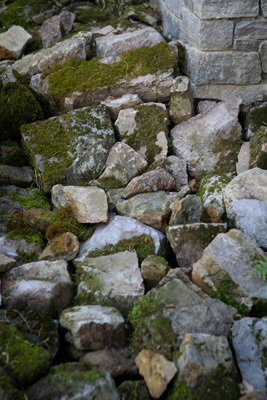 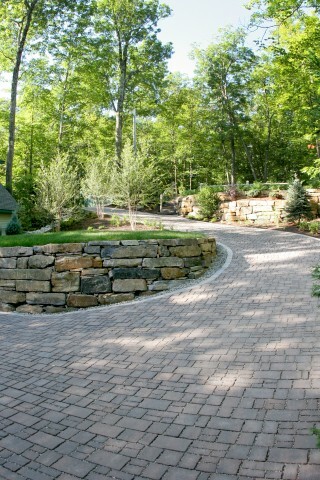 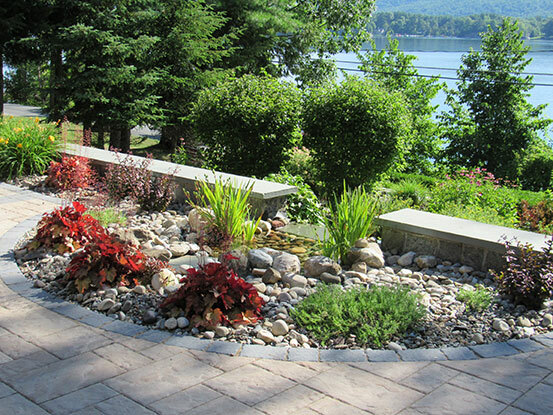 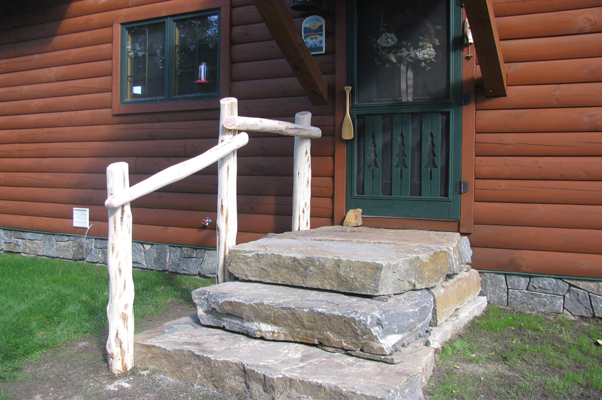 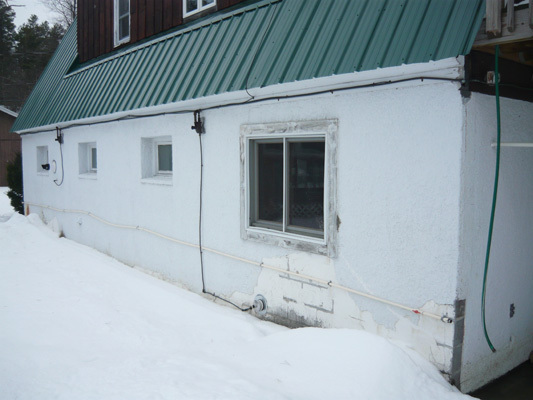 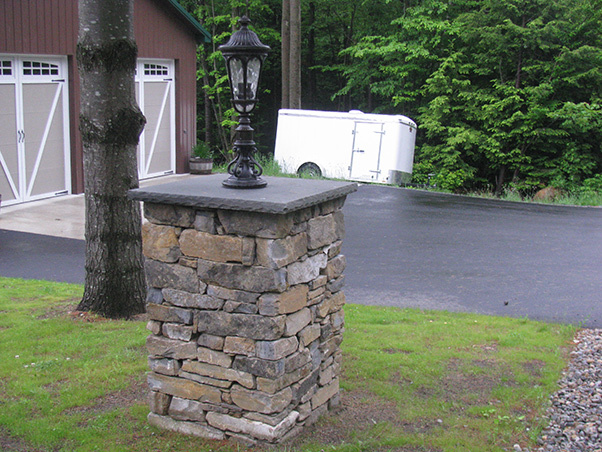 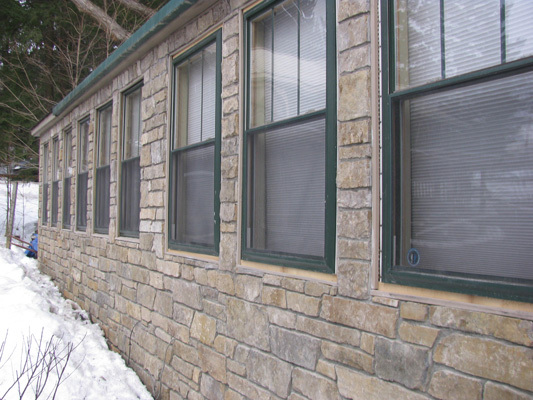 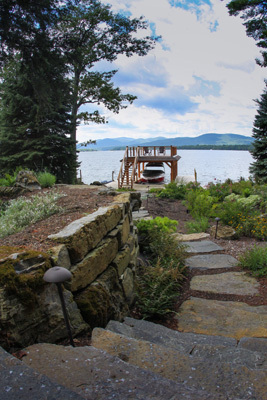 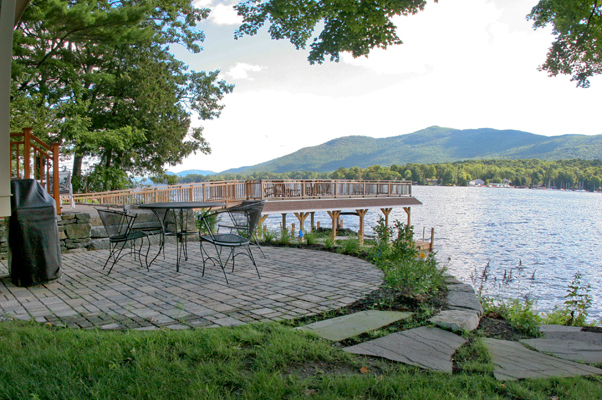 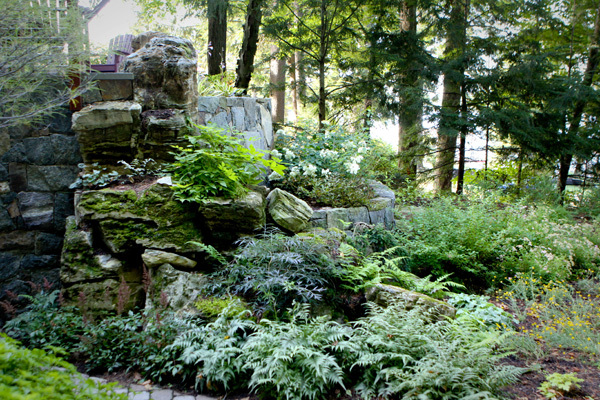 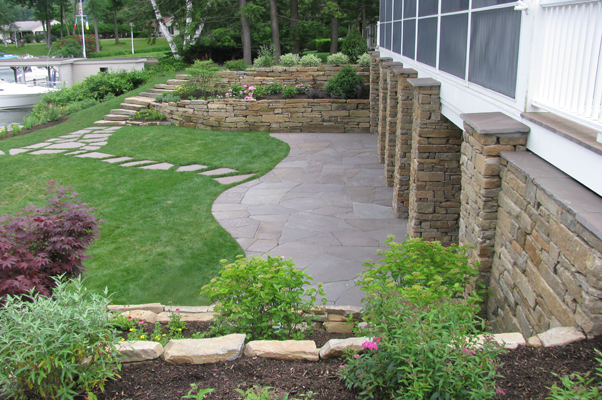 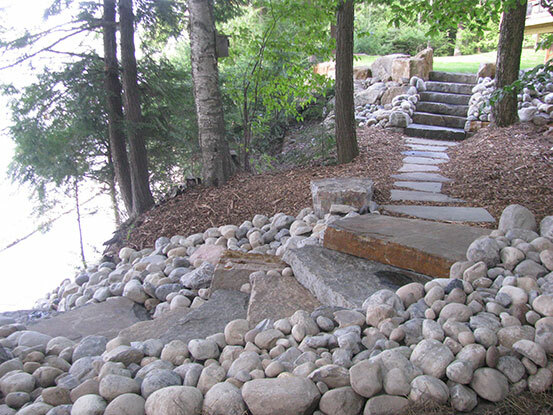 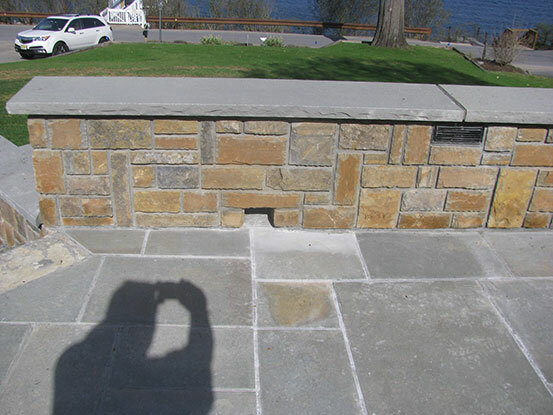 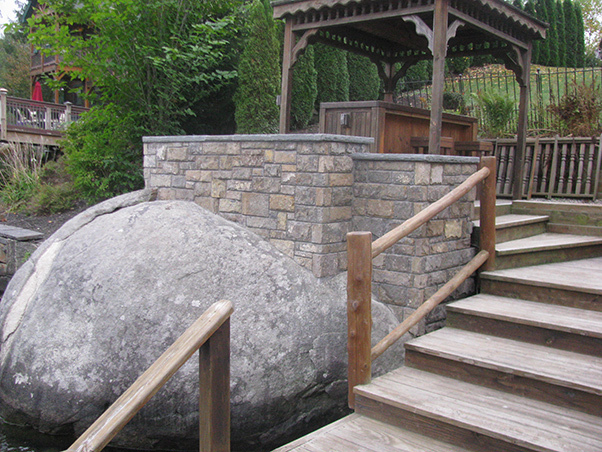 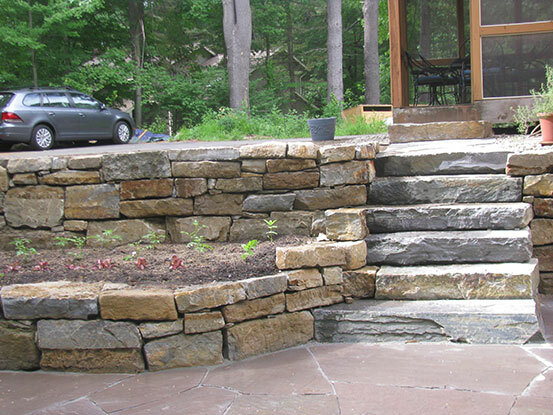 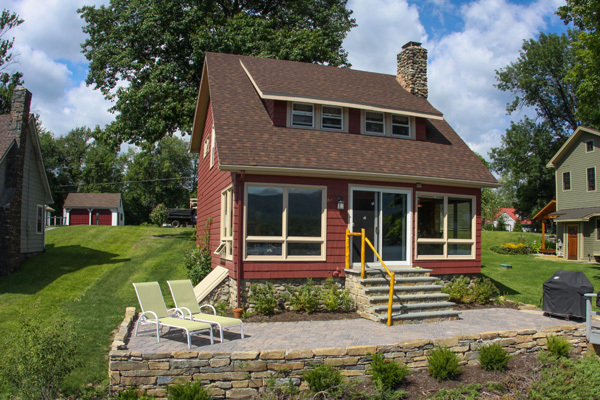 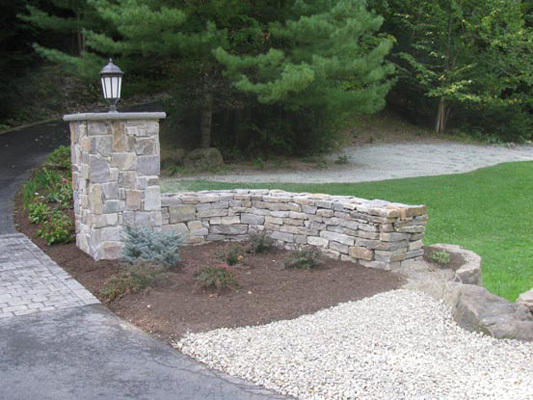 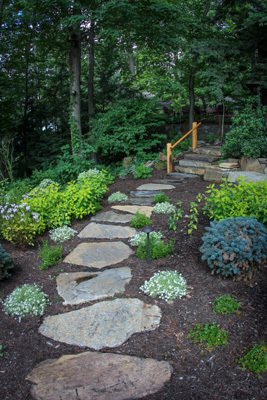 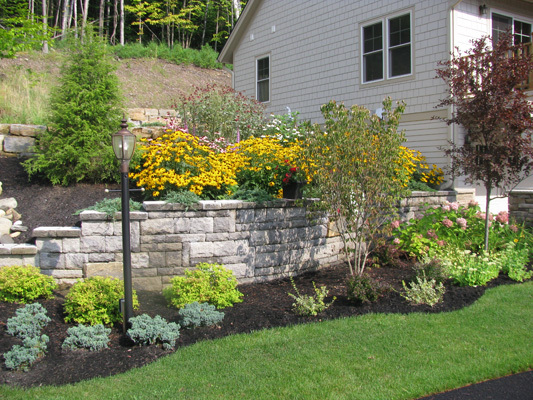 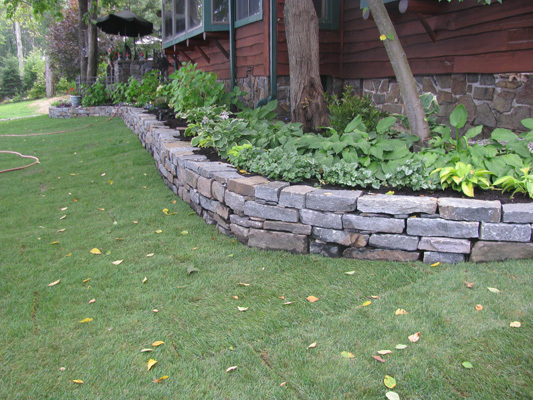 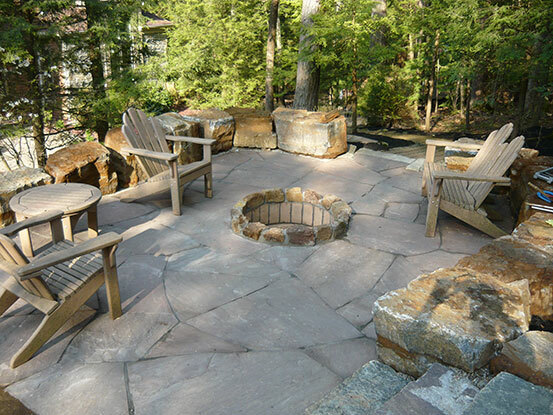 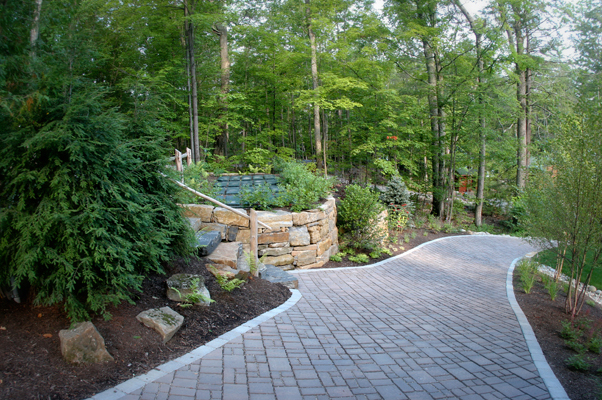 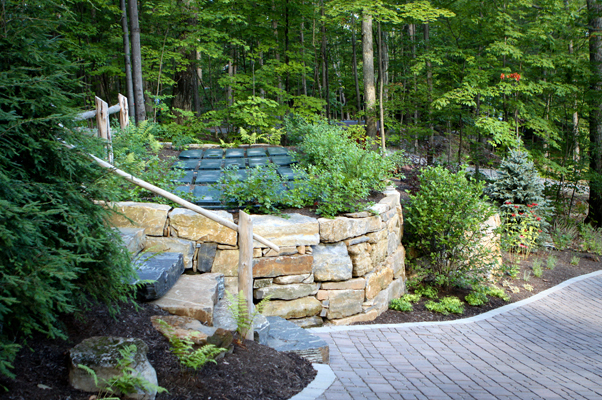 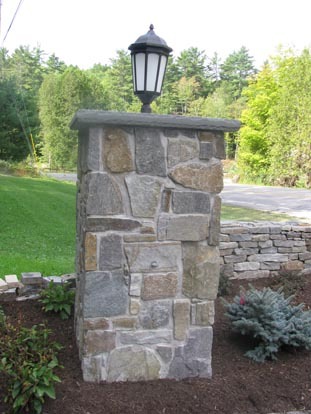 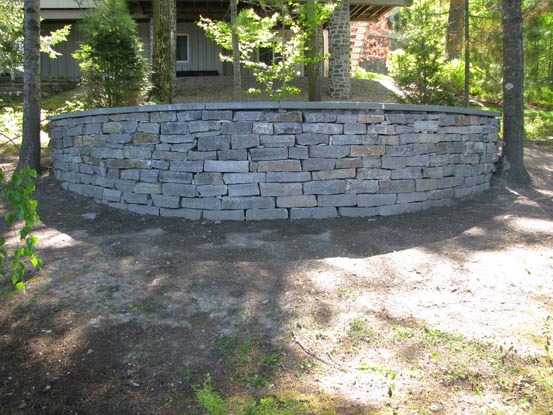 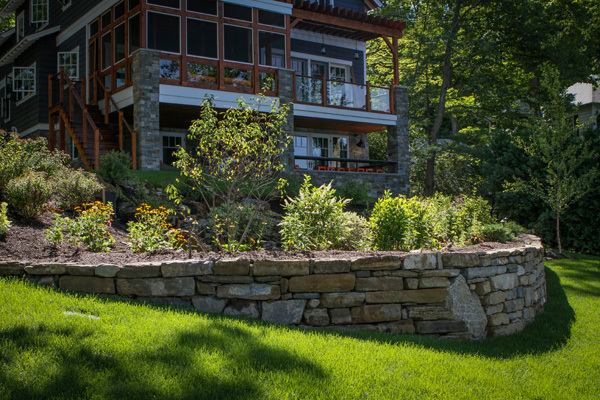 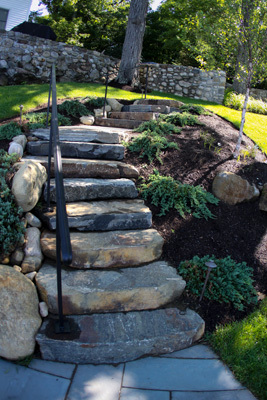 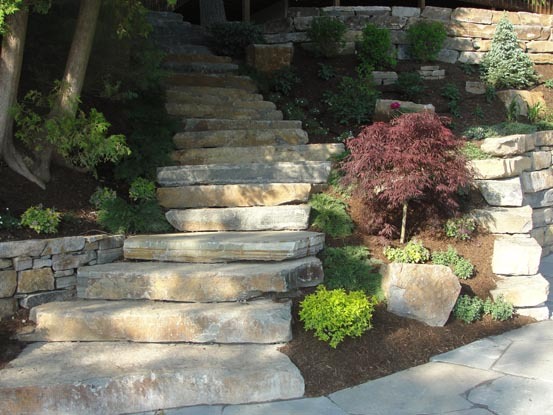 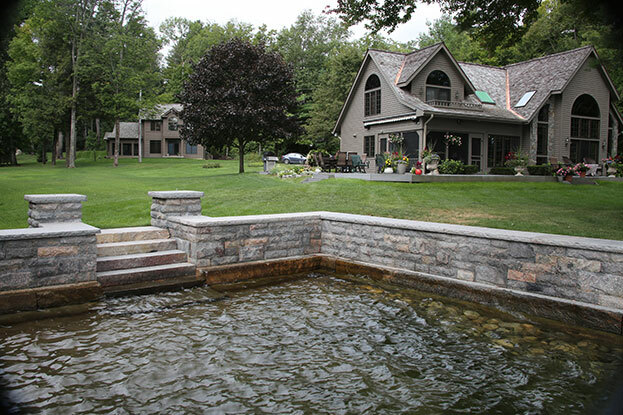 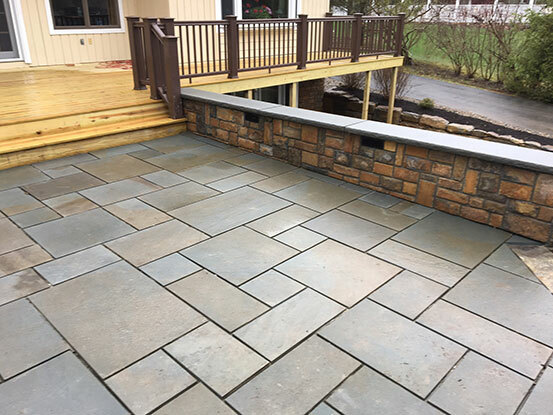 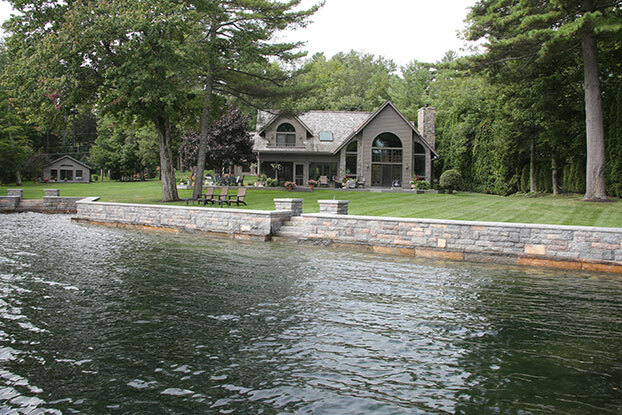 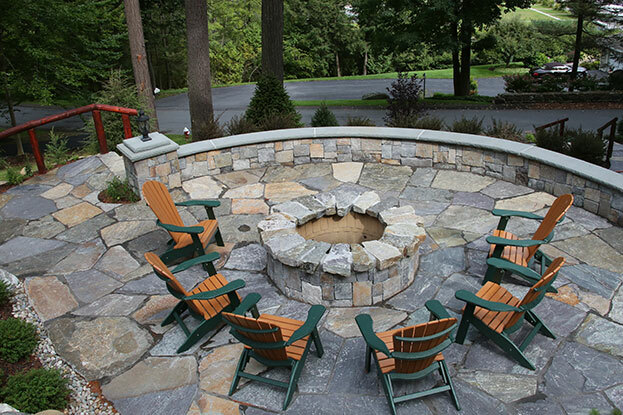 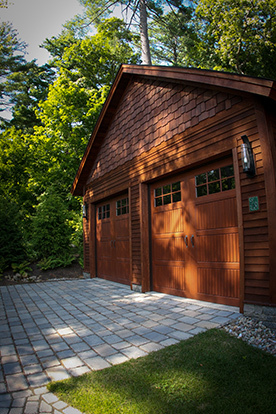 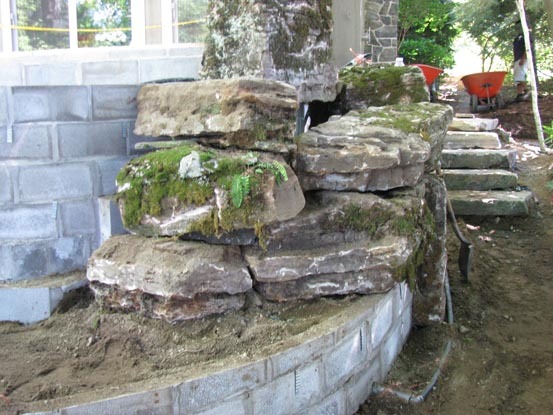 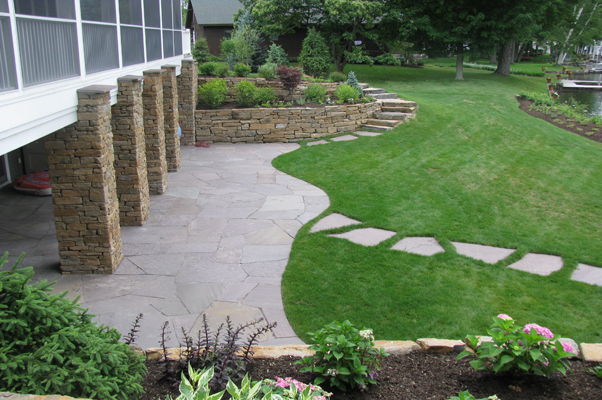 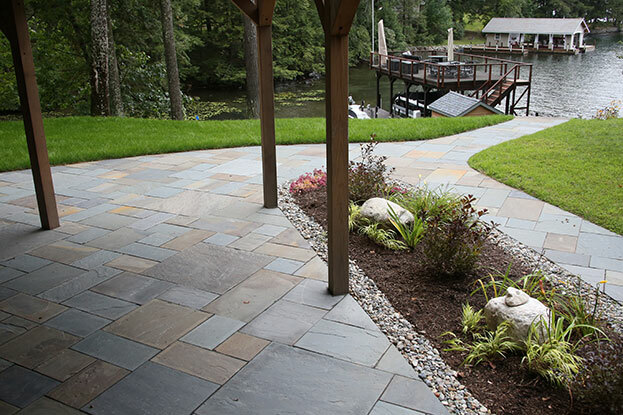 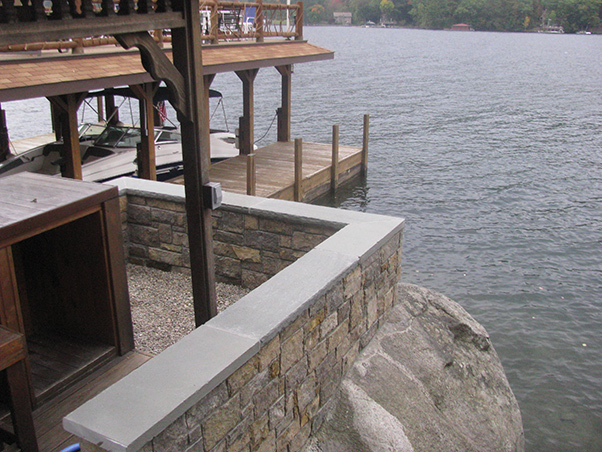 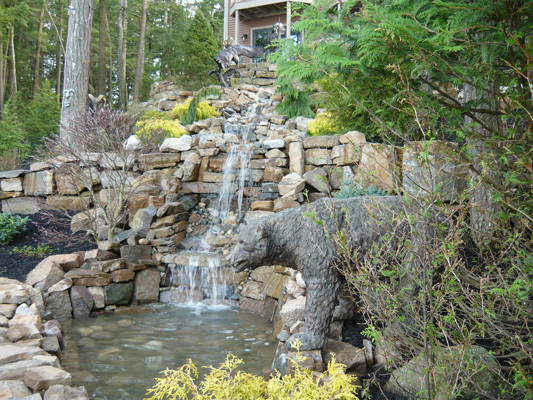 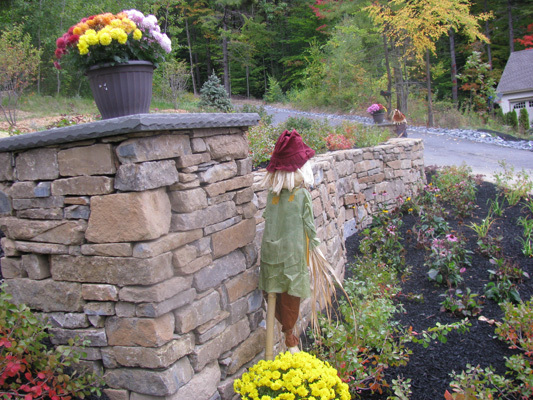 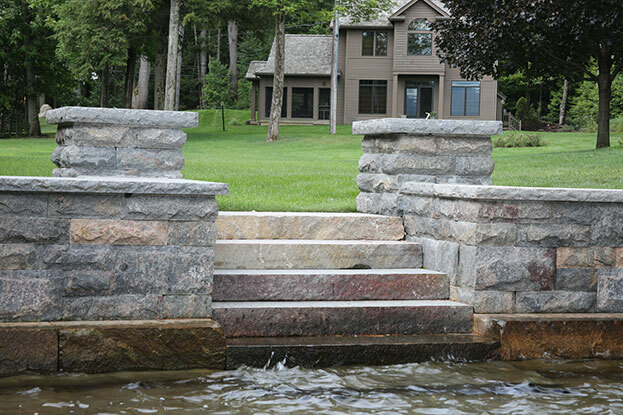 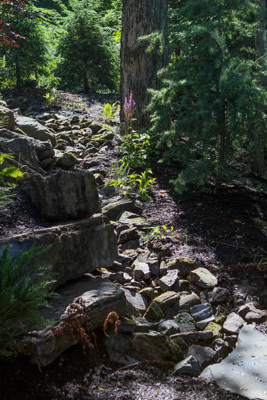 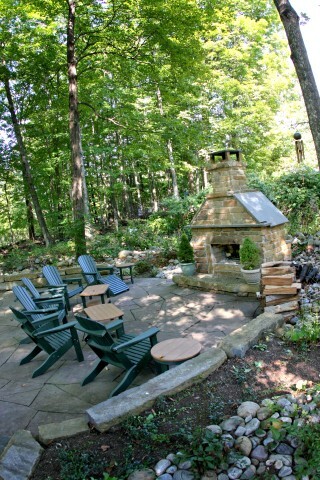 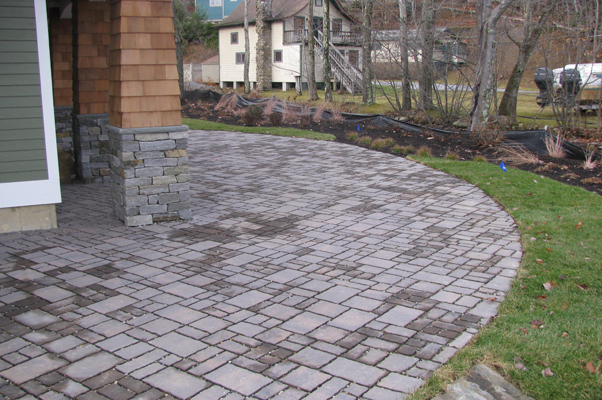 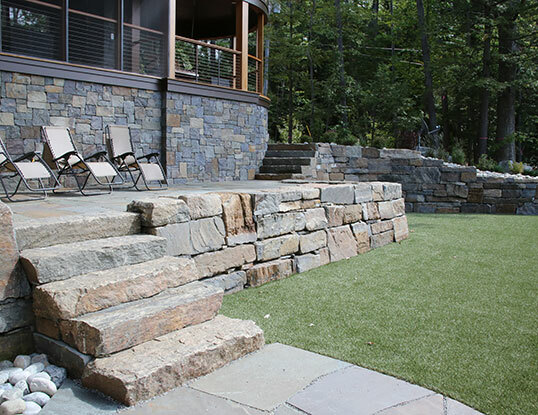 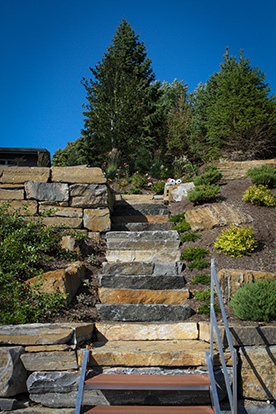 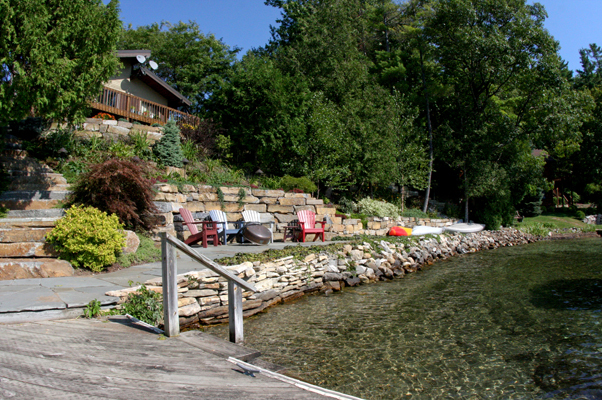 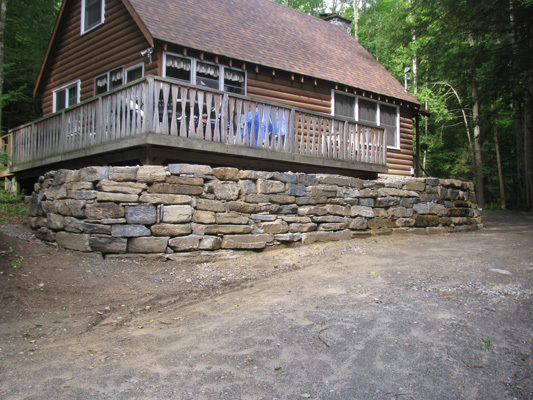 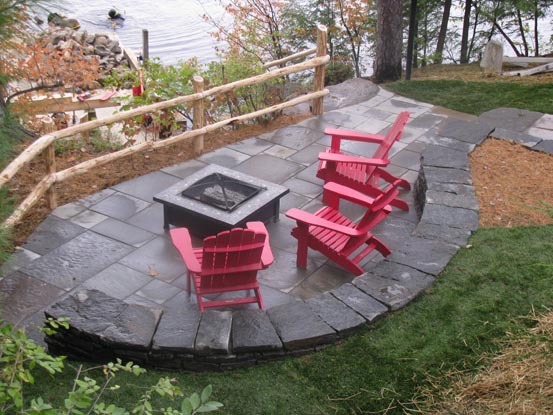 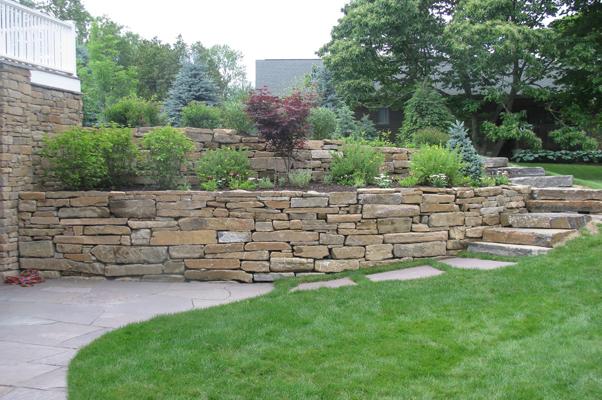 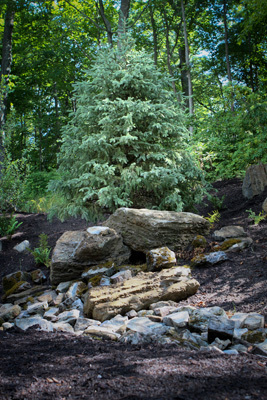 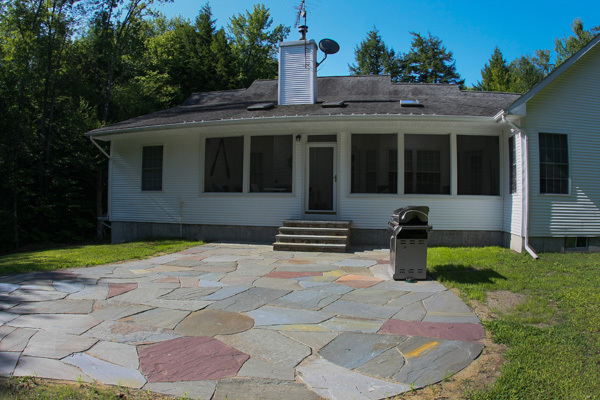 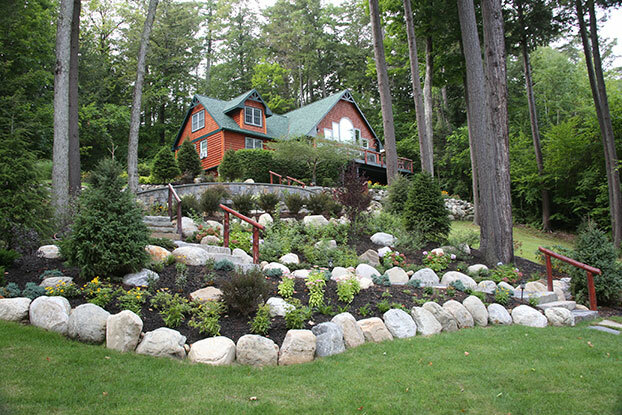 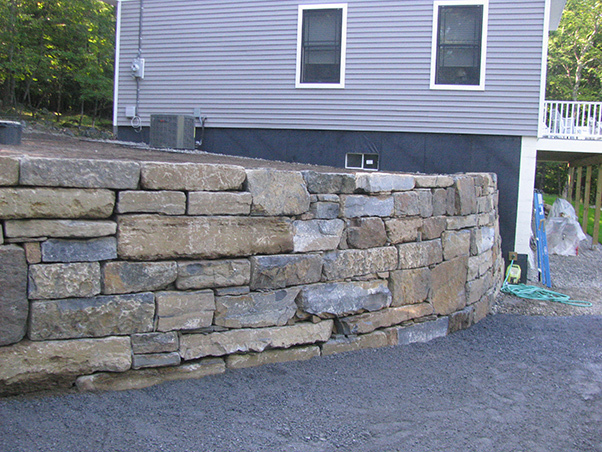 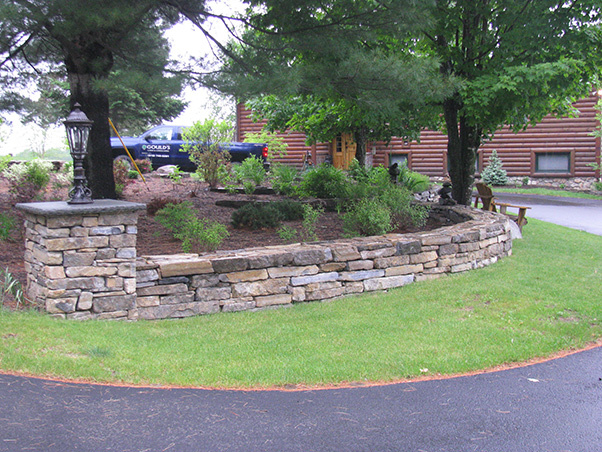 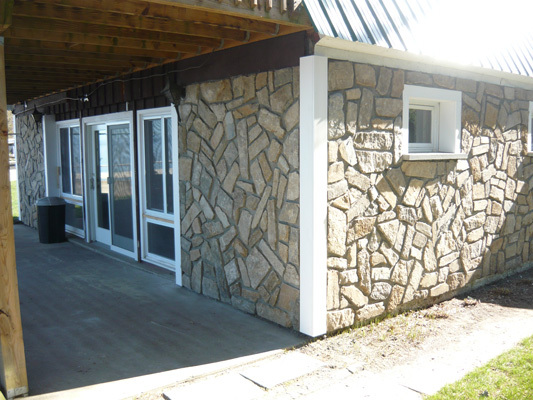 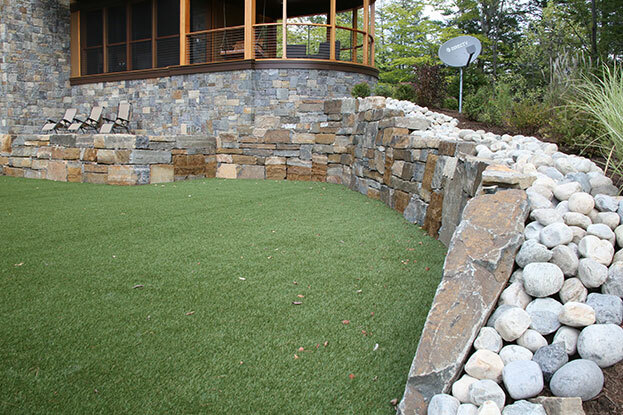 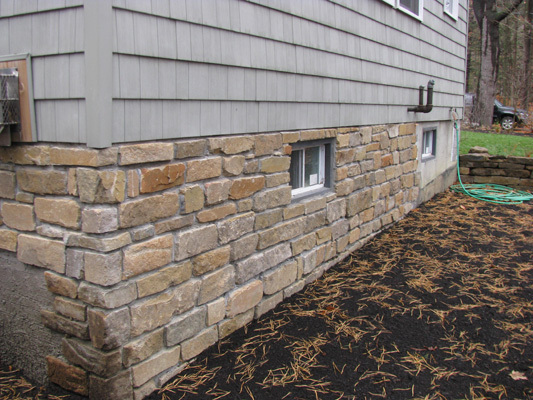 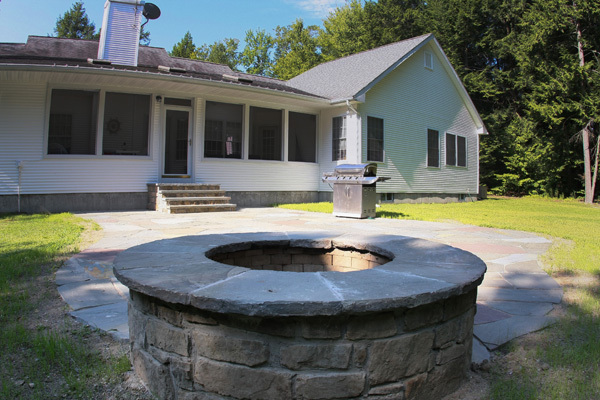 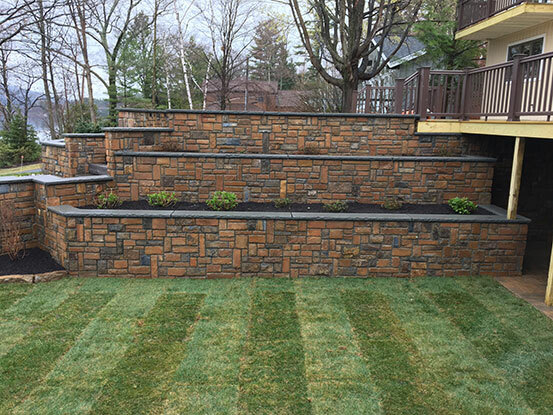 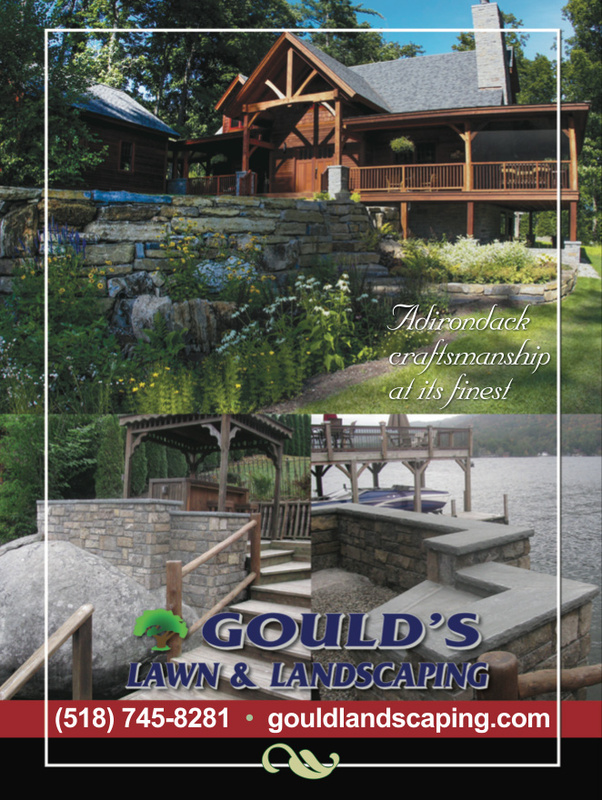 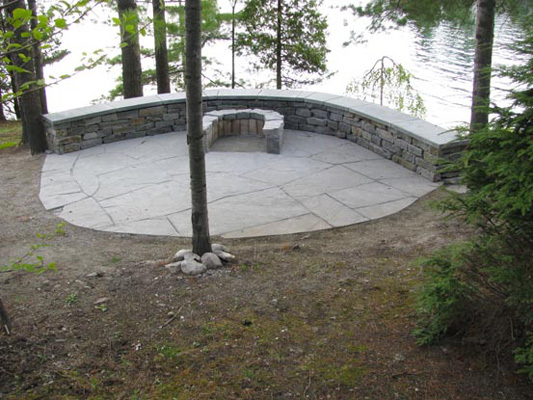 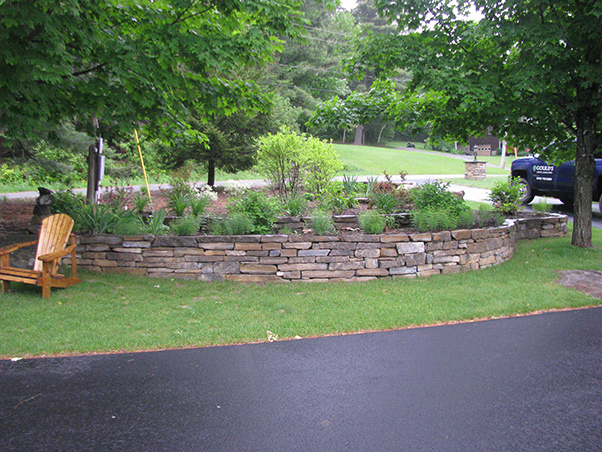 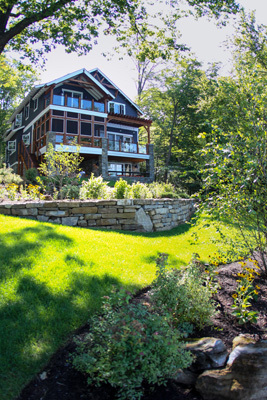 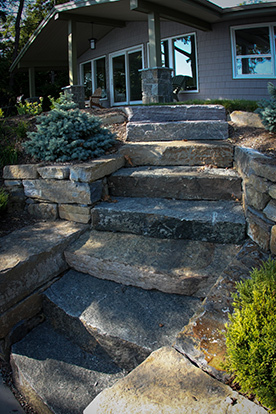 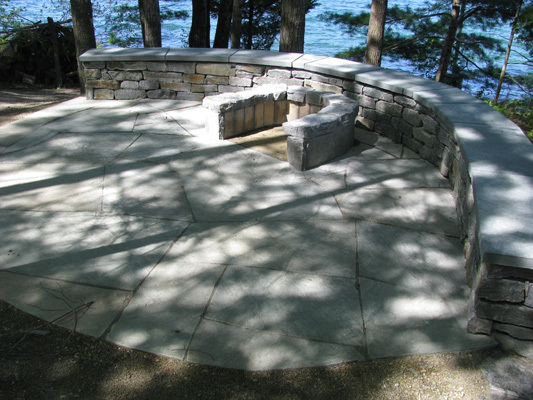 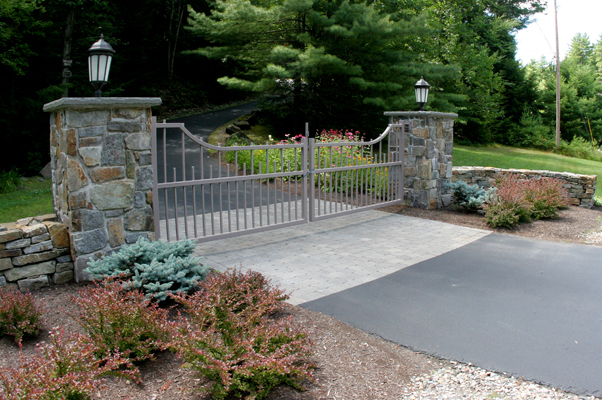 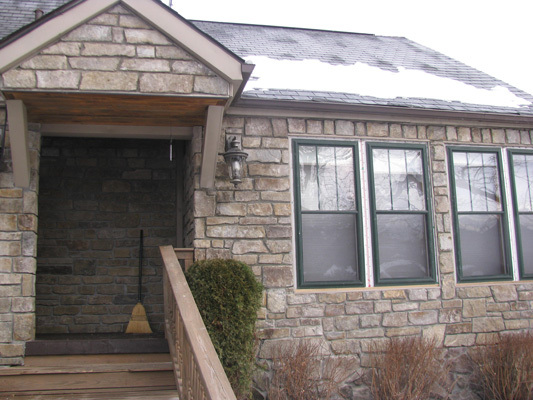 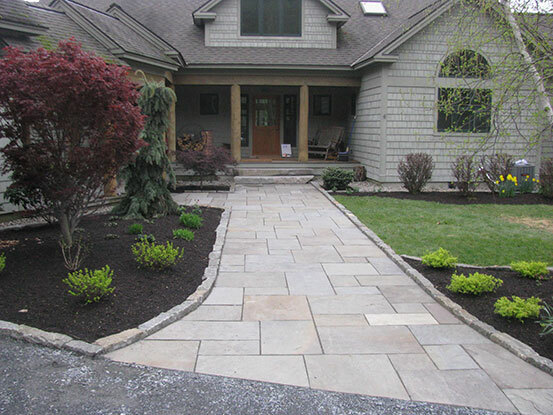 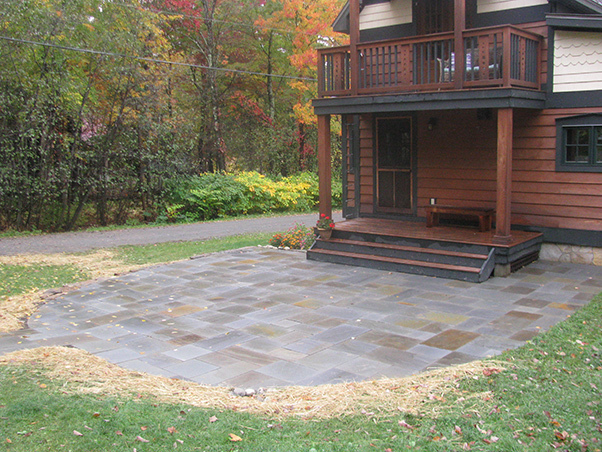 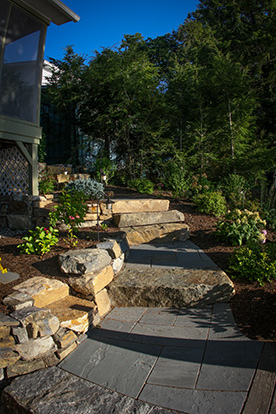 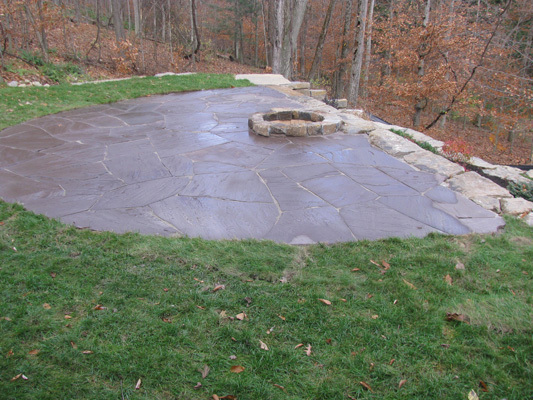 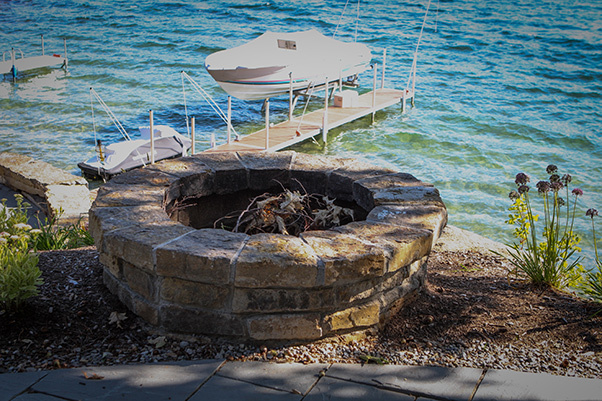 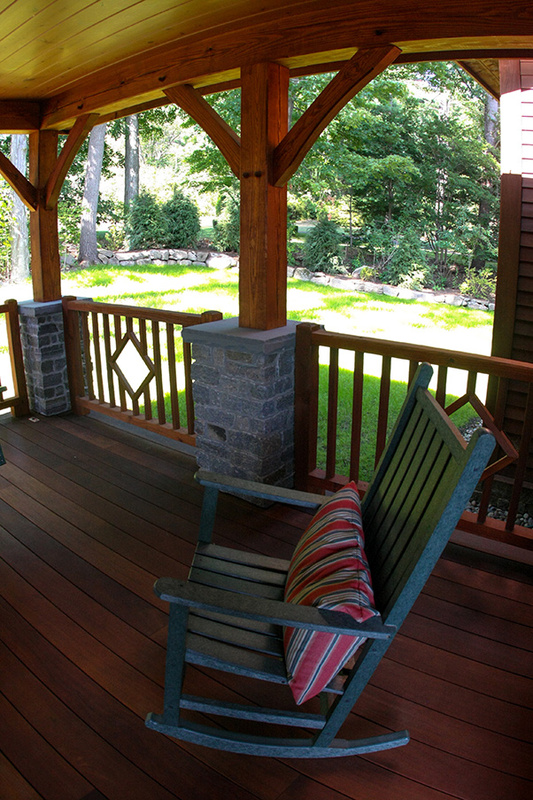 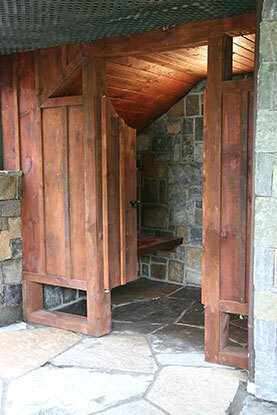 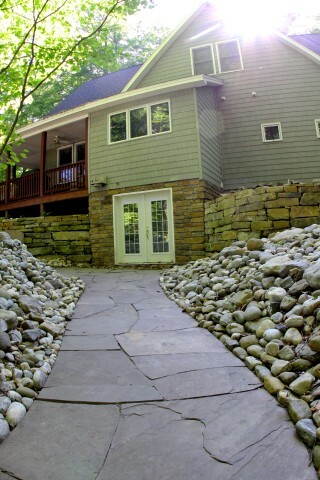 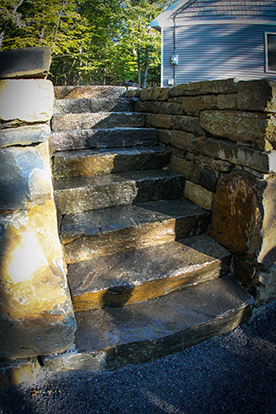 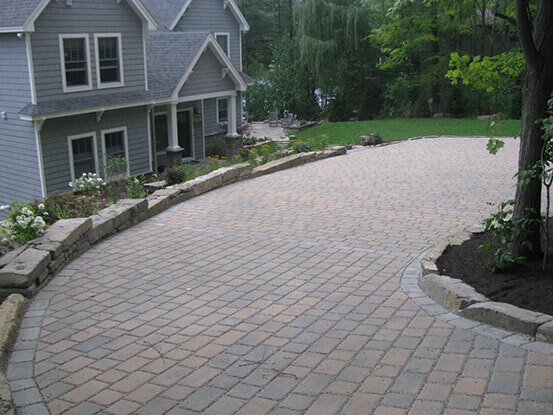 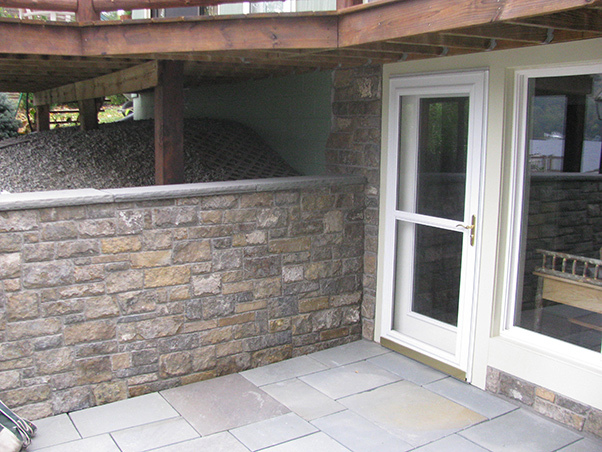 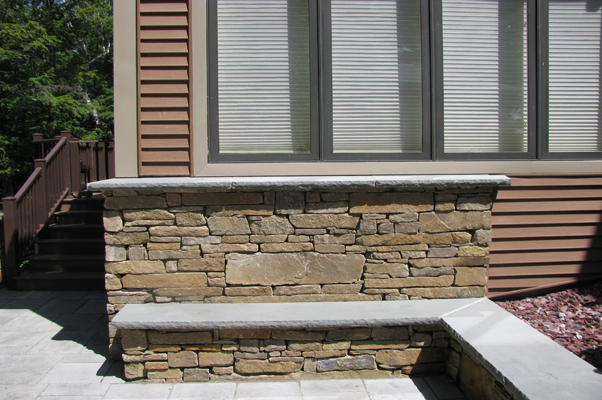 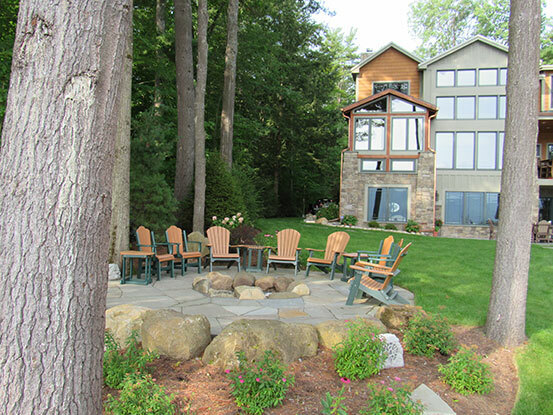 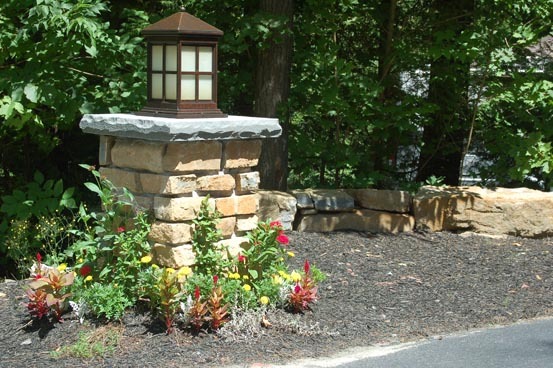 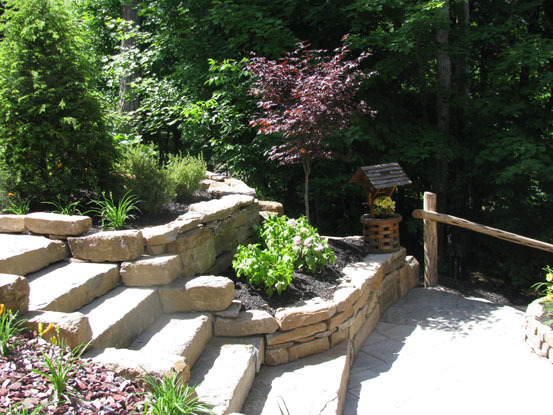 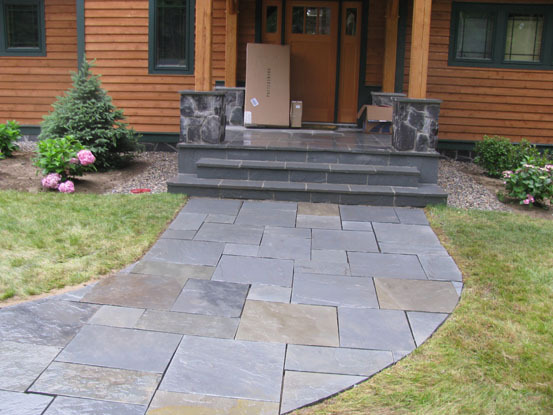 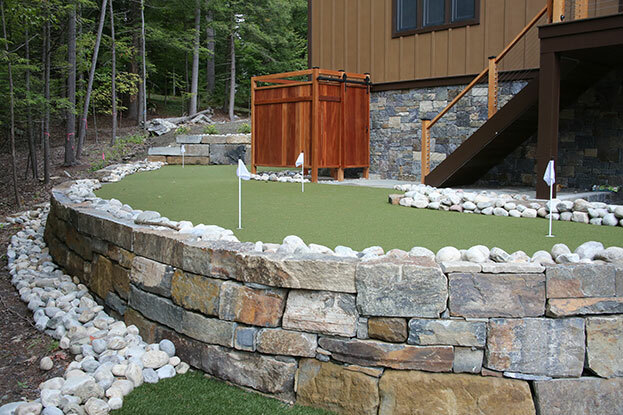 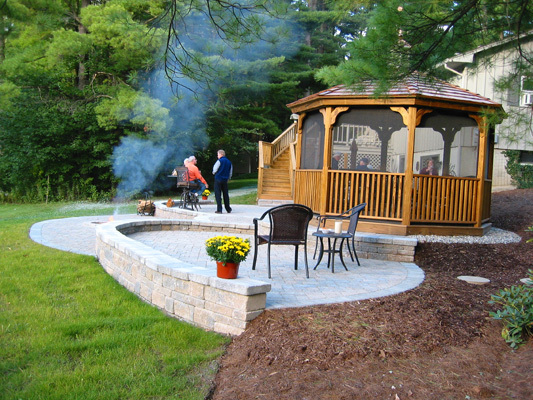 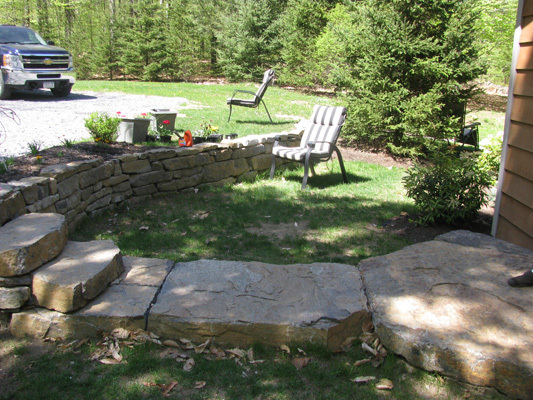 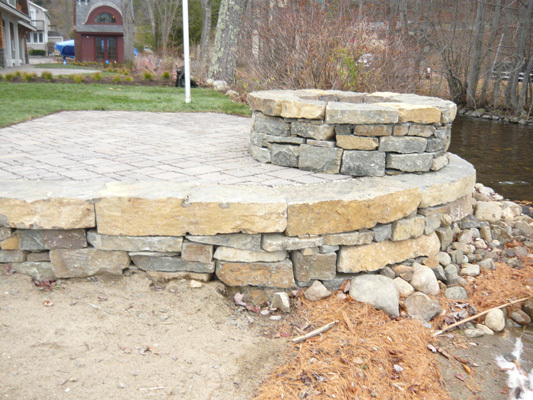 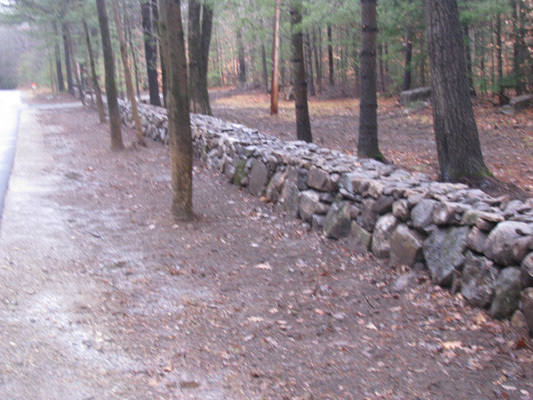 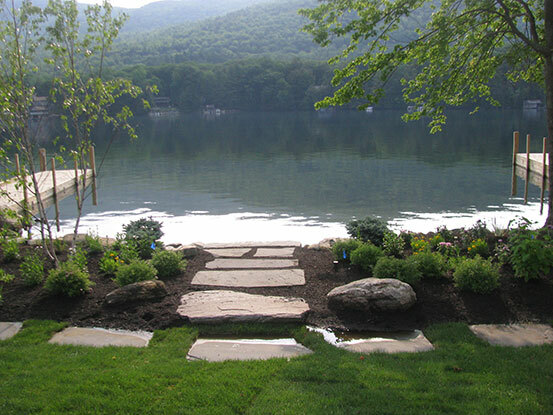 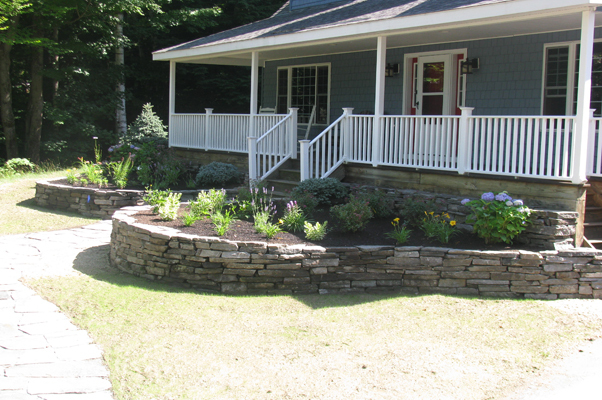 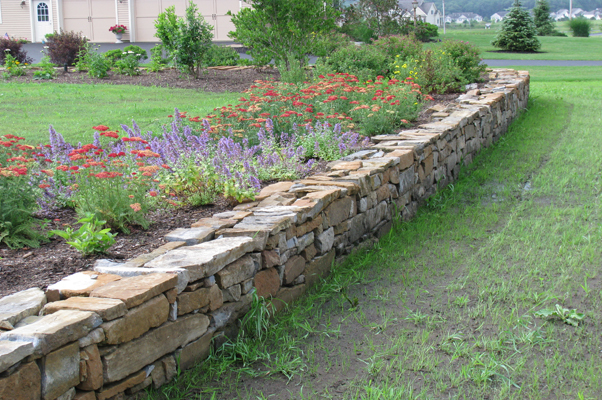 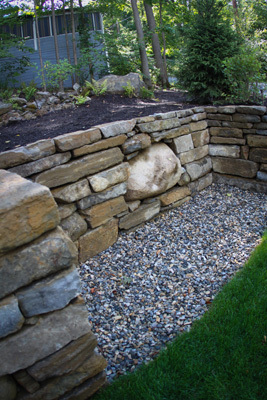 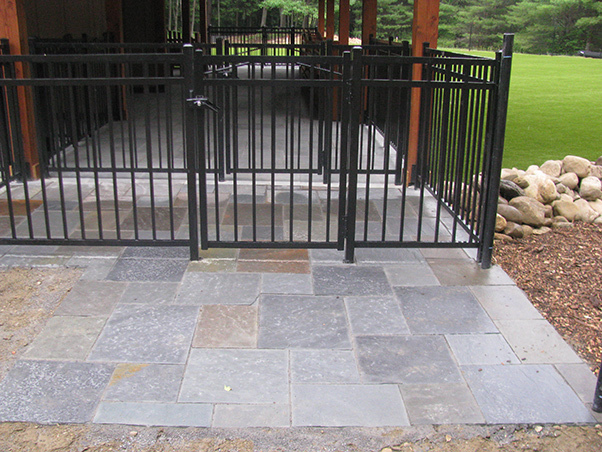 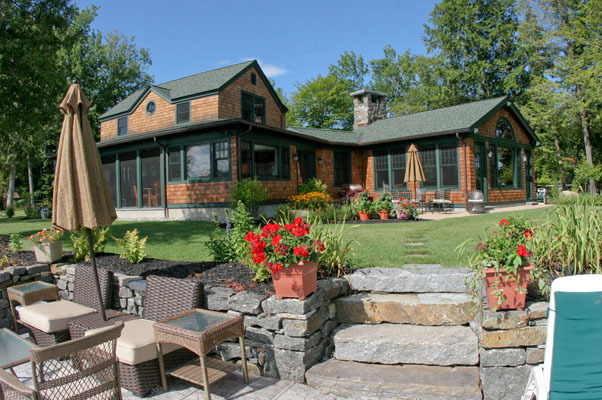 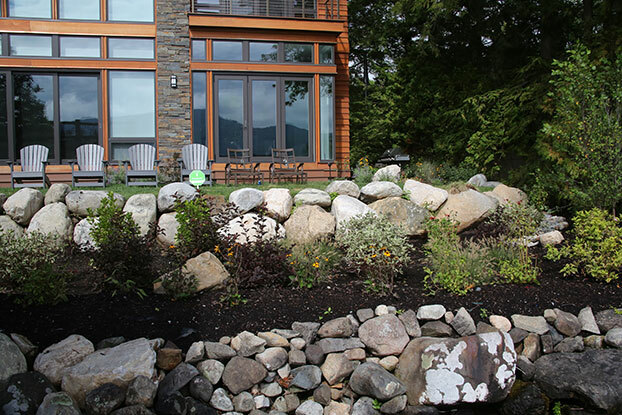 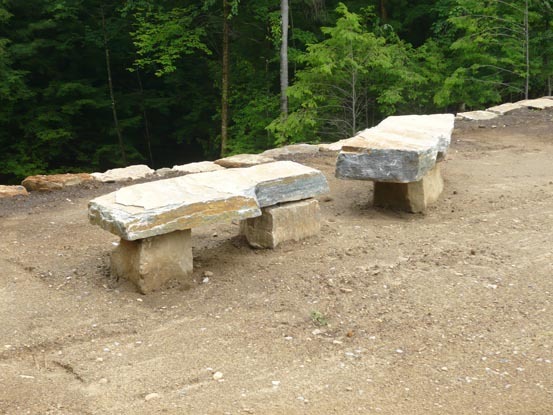 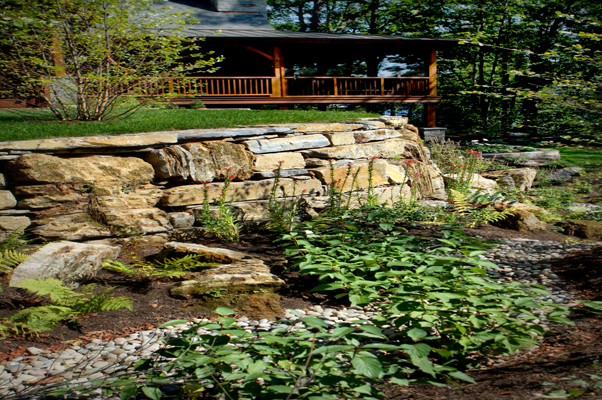 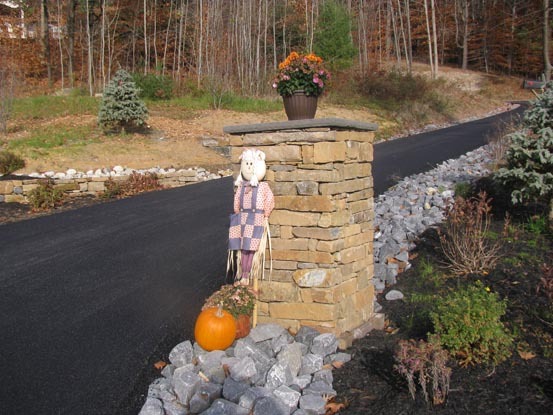 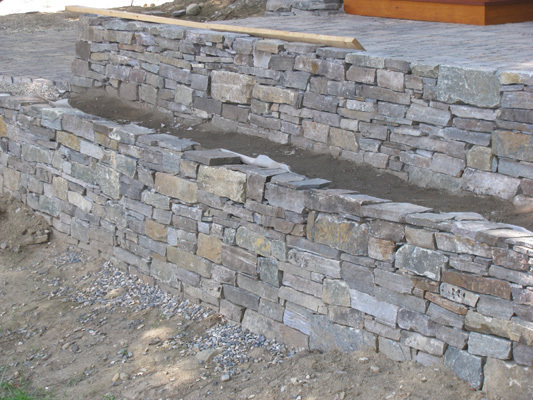 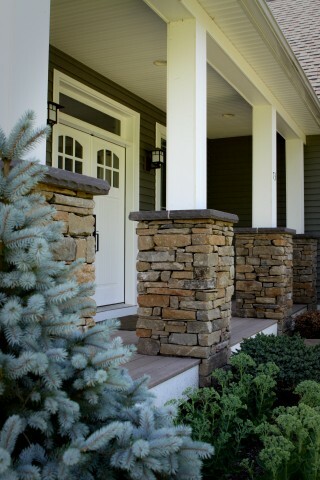 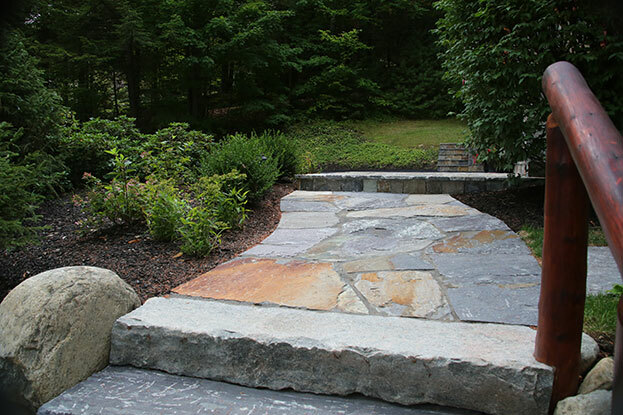 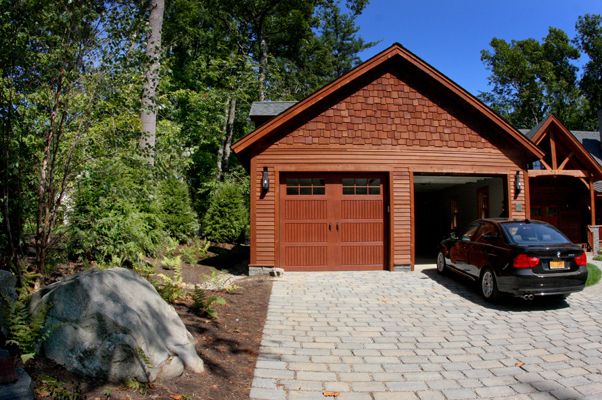 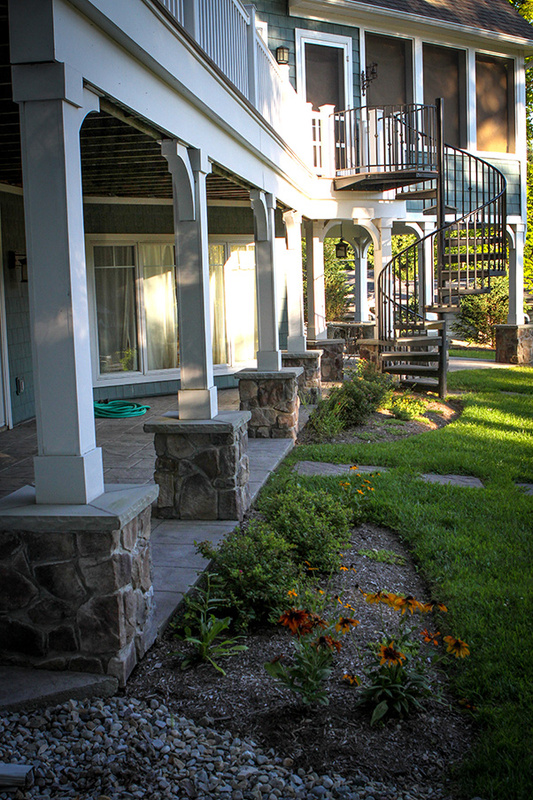 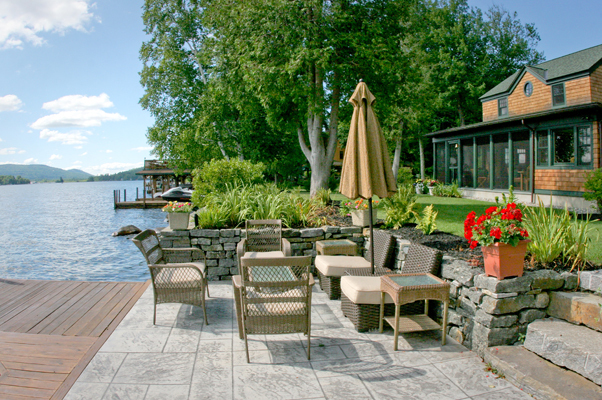 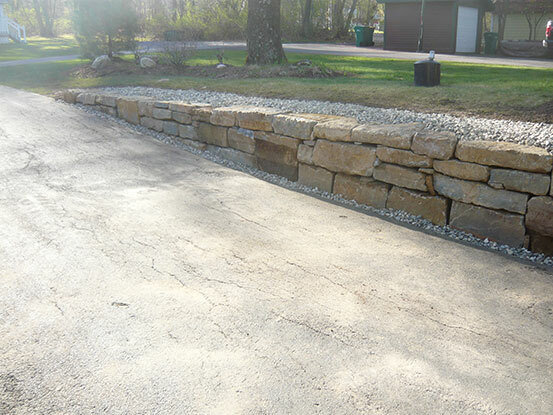 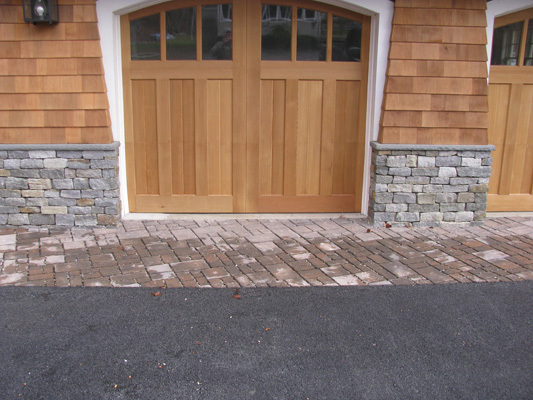 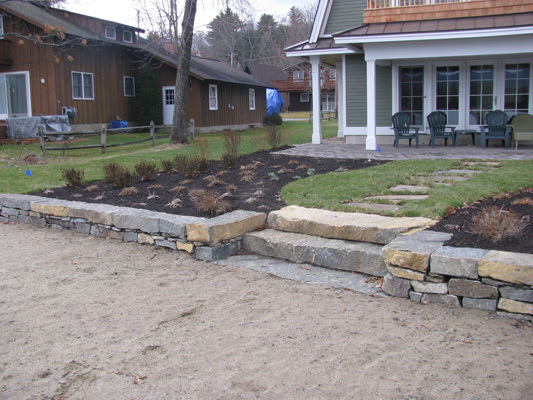 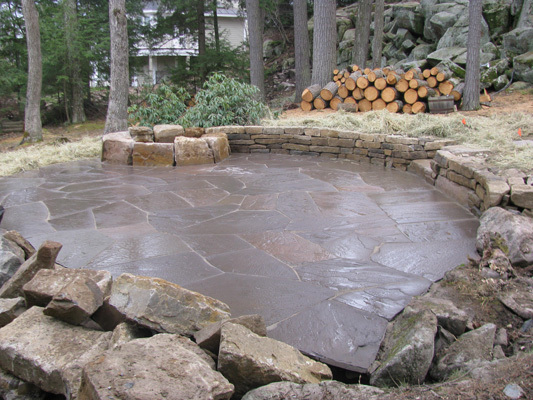 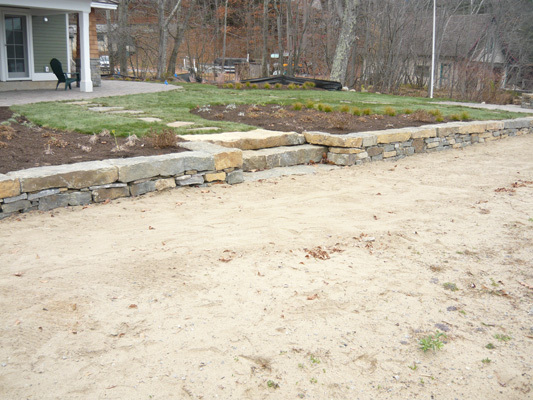 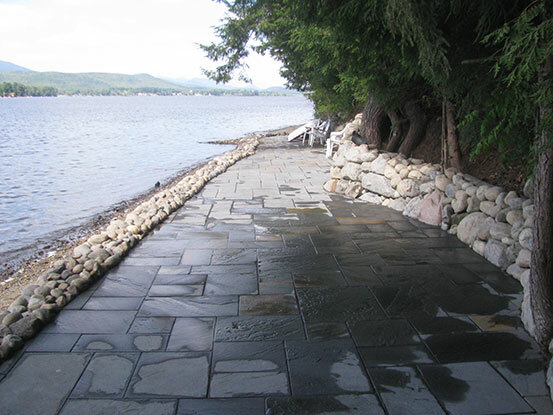 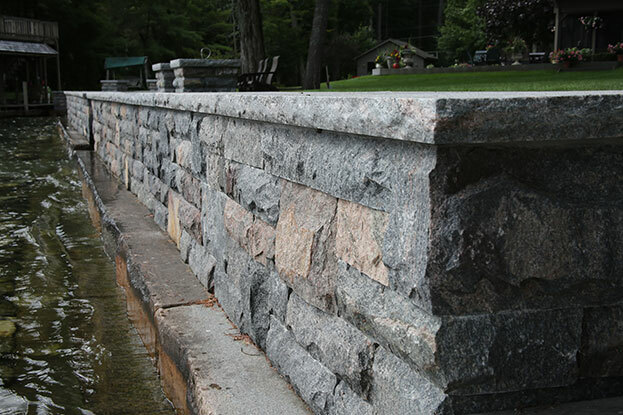 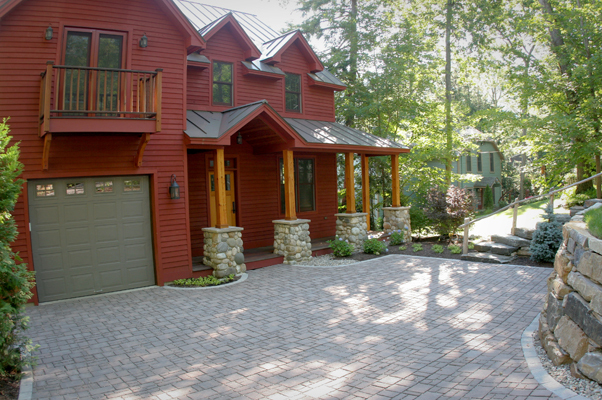 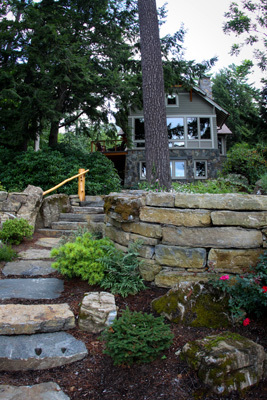 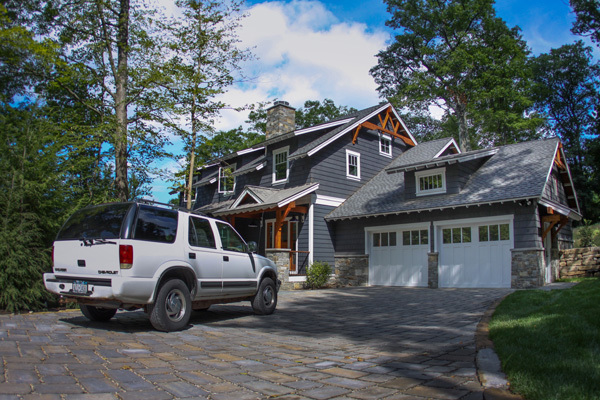 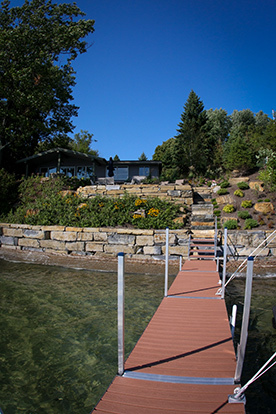 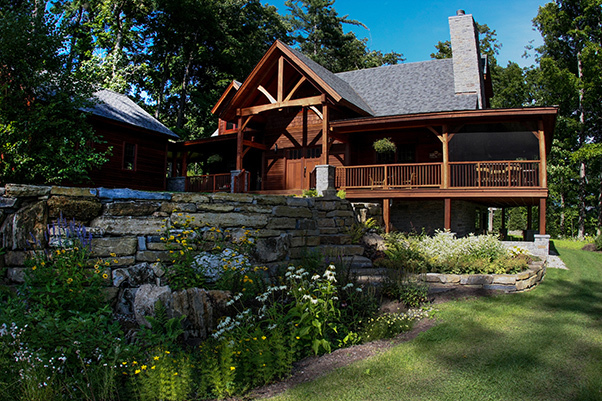 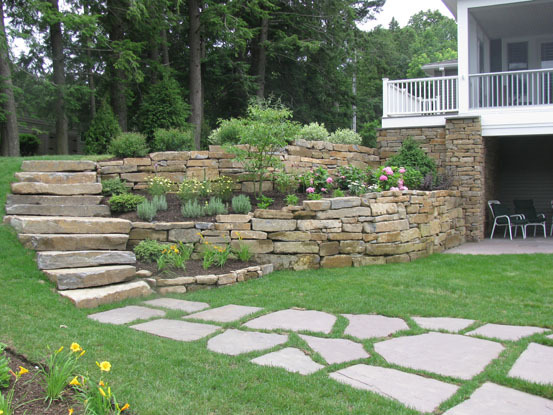 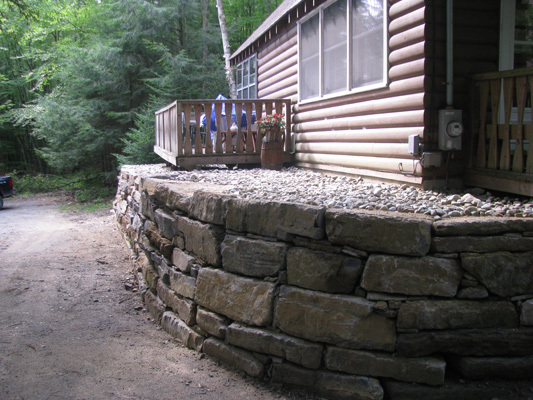 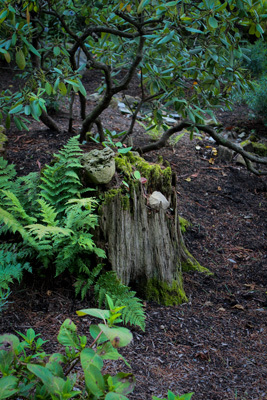 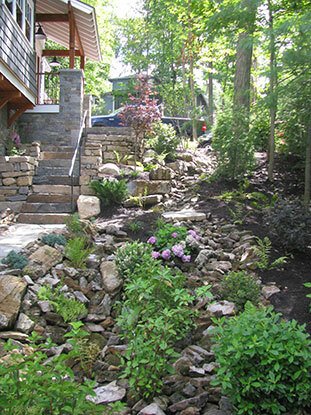 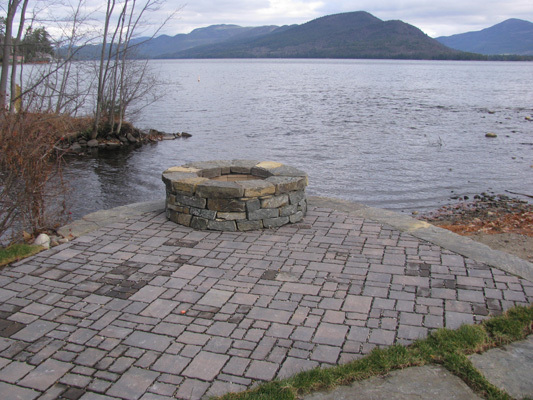 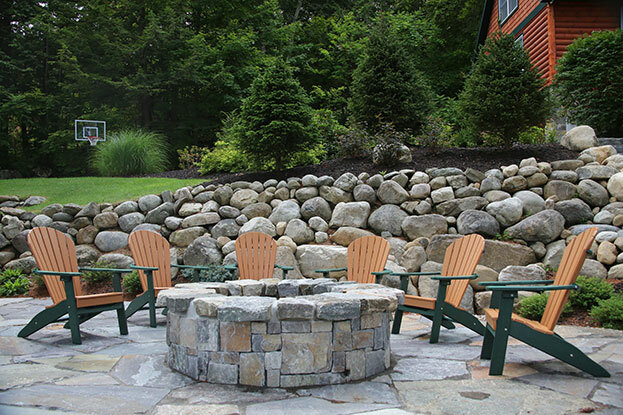 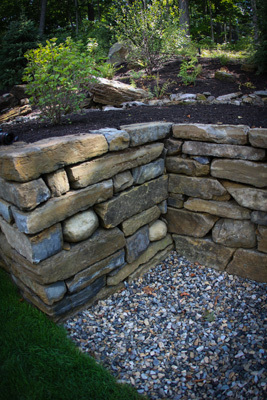 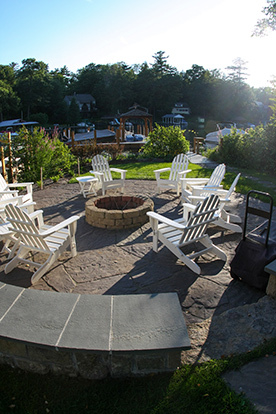 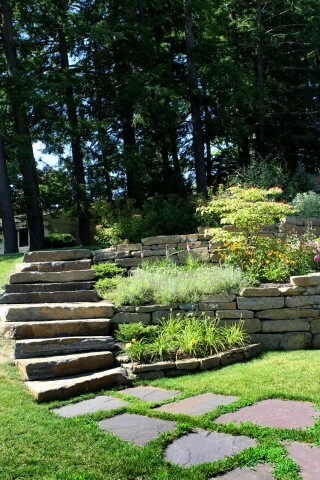 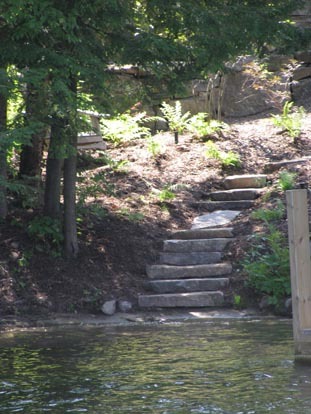 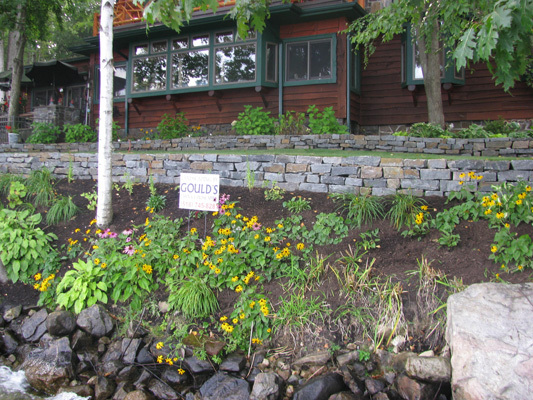 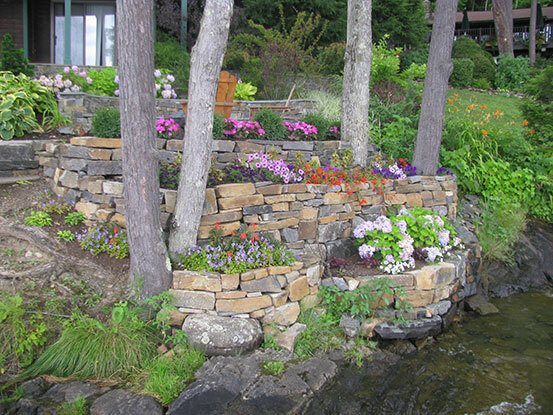 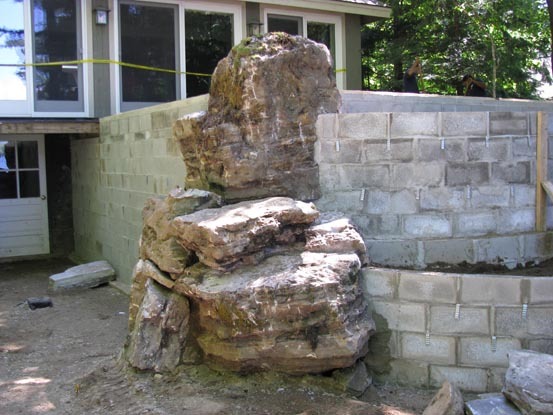 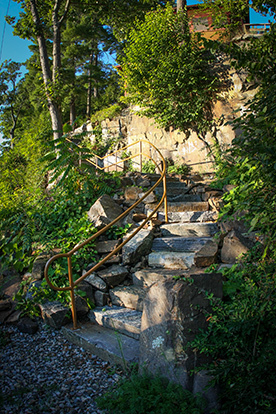 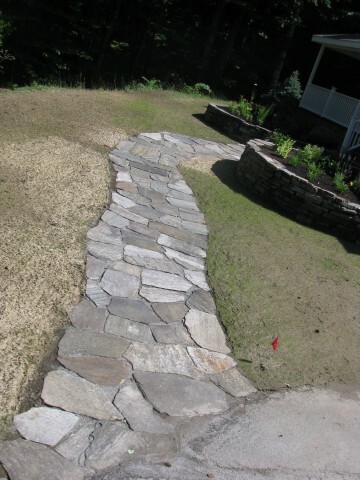 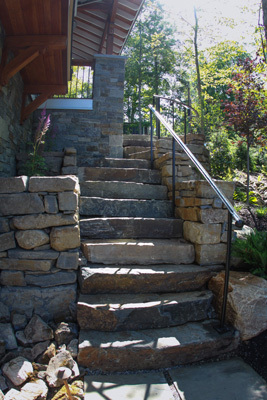 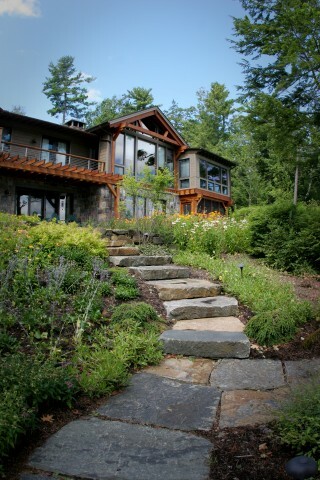 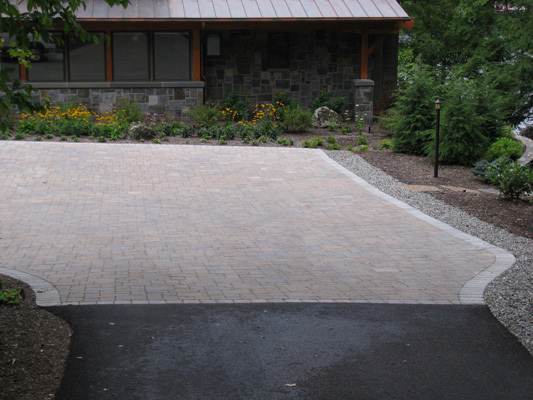 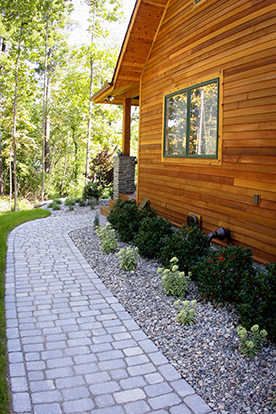 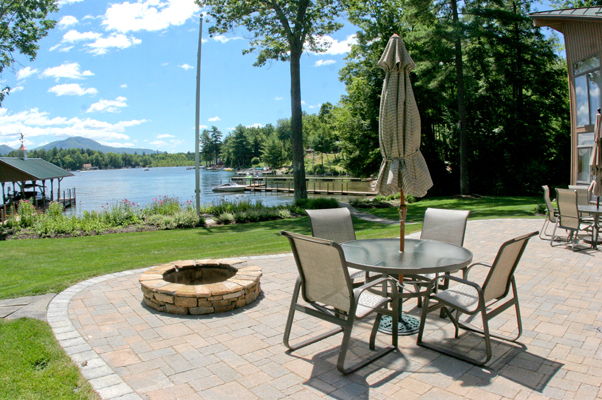 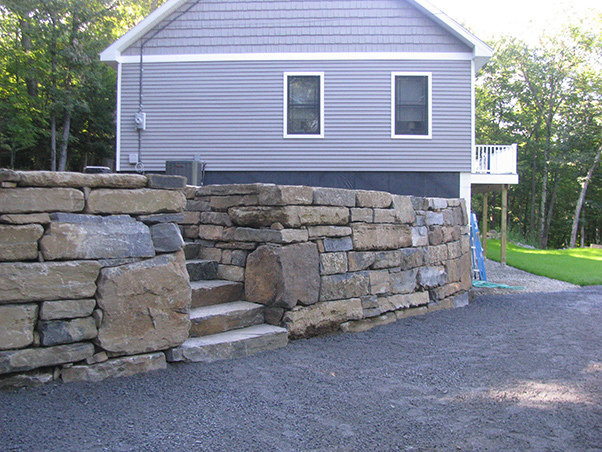 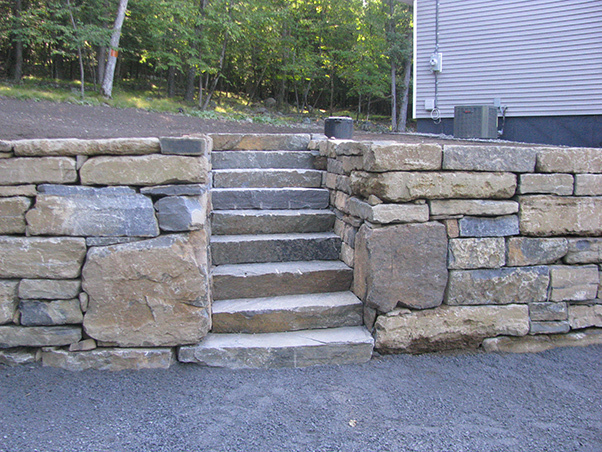 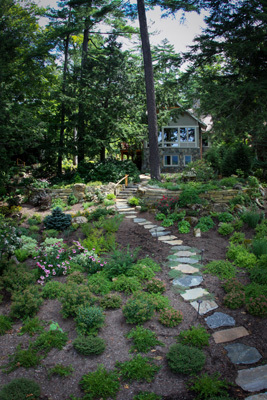 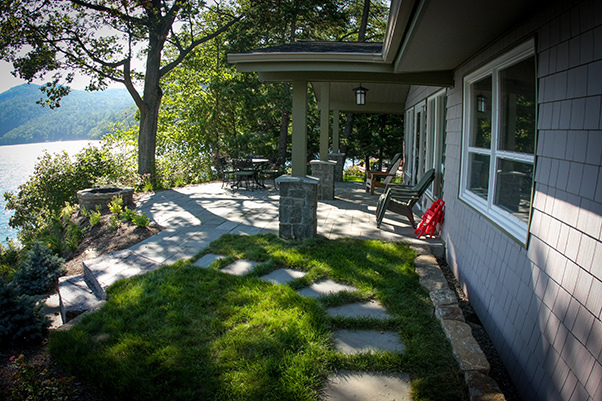 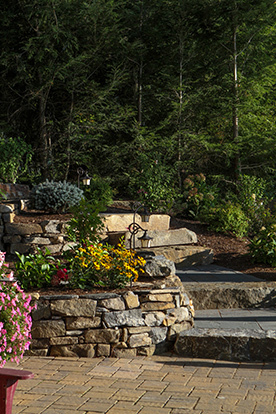 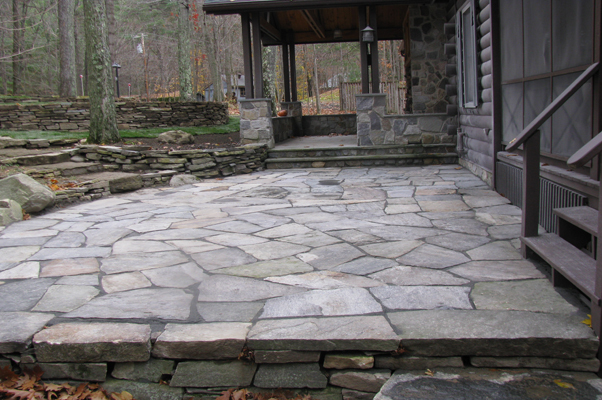 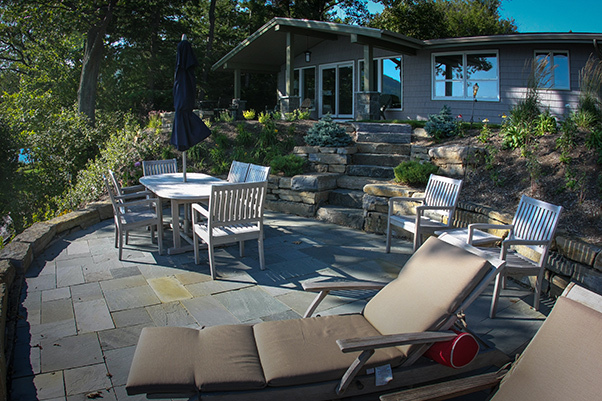 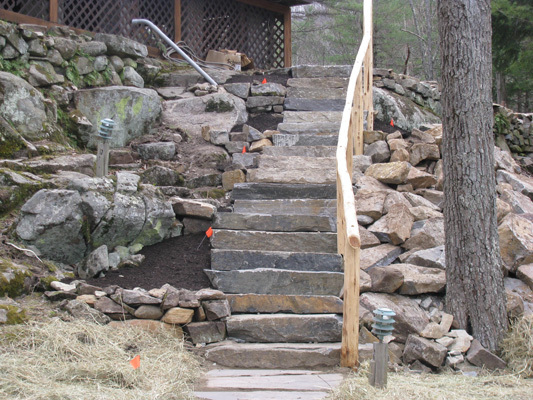 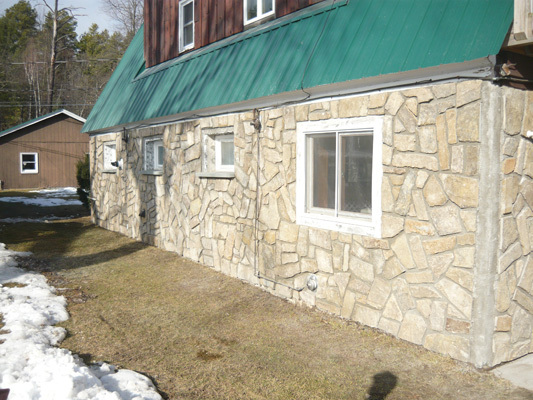 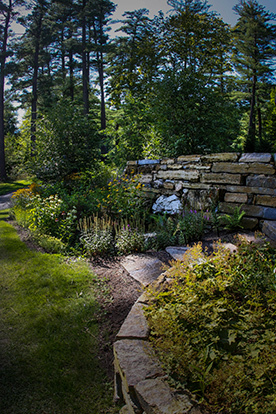 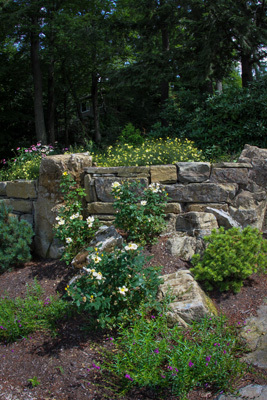 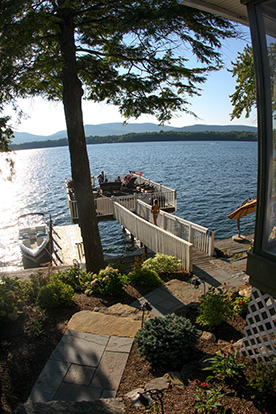 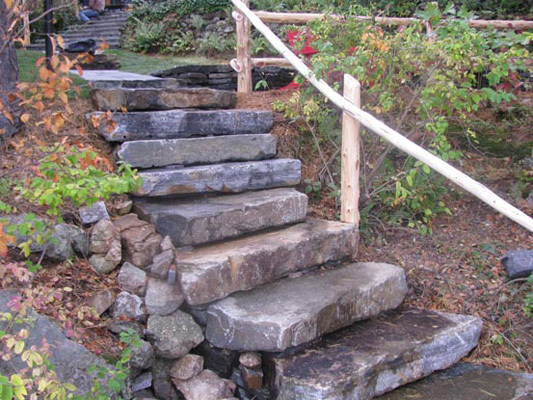 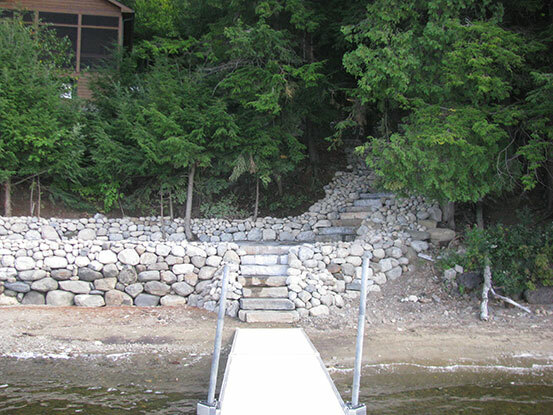 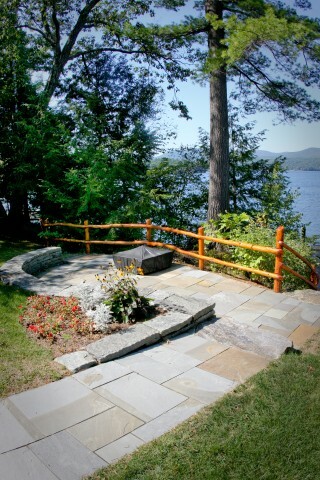 Our dry stacked limestone retaining, and decorative walls are examples of hardscape features that fit very well in the Adirondack region due to its rustic and natural appearance. 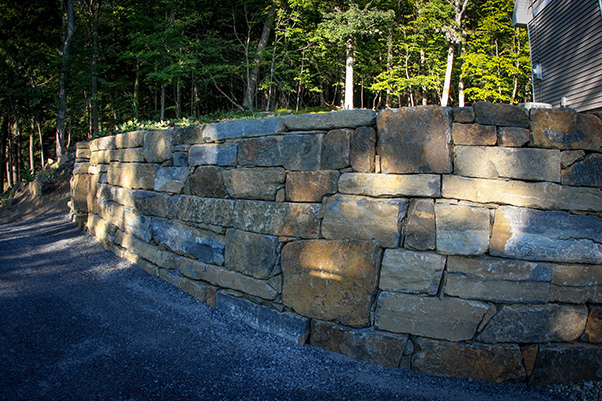 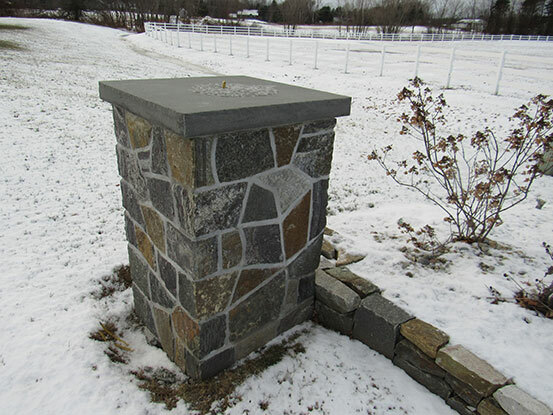 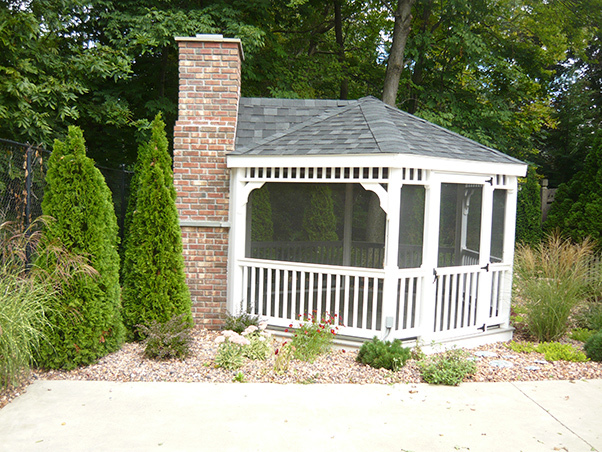 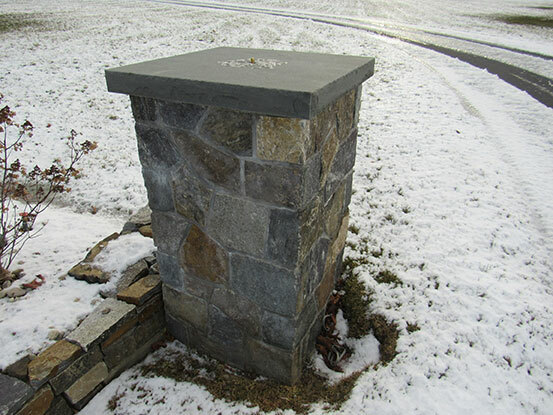 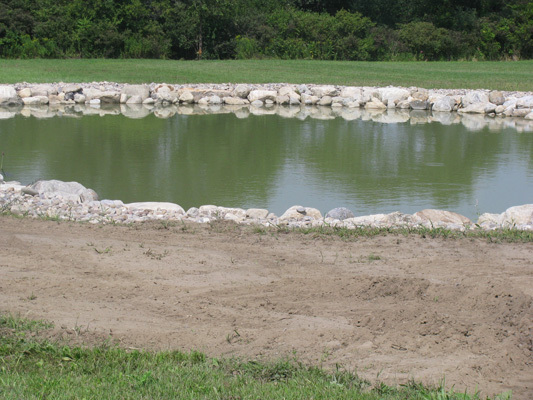 Our limestone wall block is unique to our quarry and available in a variety sizes that suit most any application. 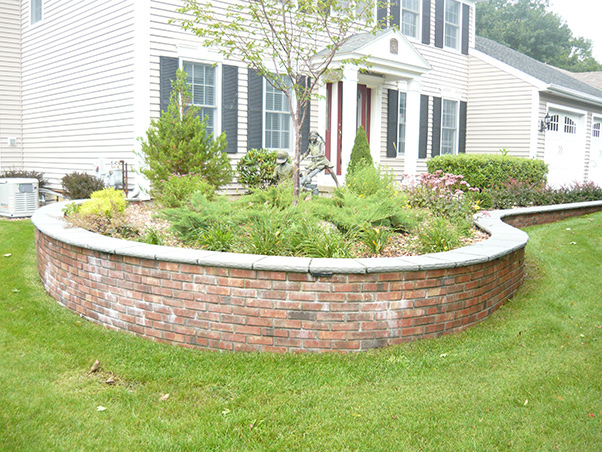 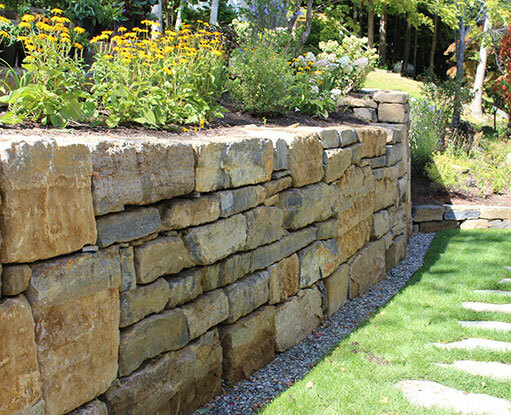 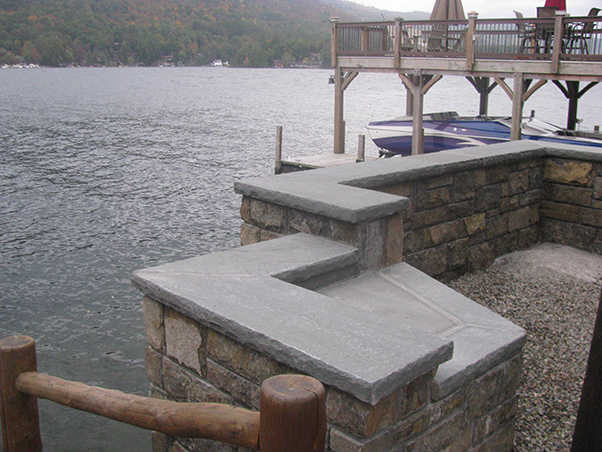 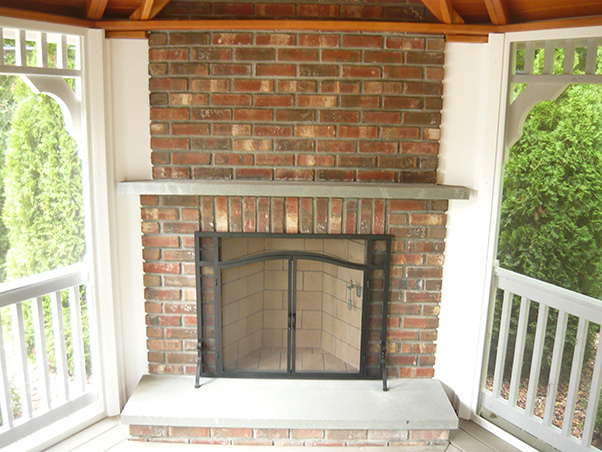 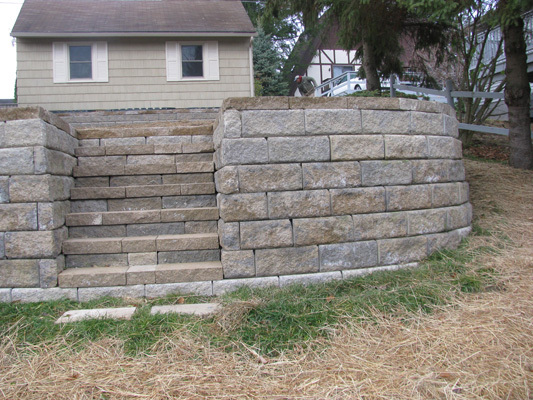 Pre-cast wall block is a manufactured material, popular for its versatile ability to be used for many different purposes such as staircases, fire pits, cooking stations, patio borders, and both decorative walls and retaining walls. 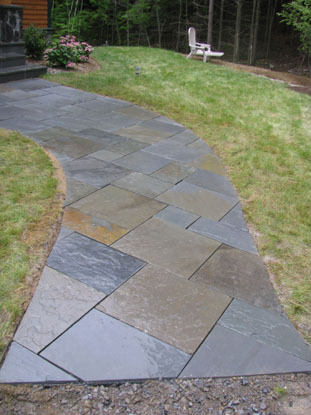 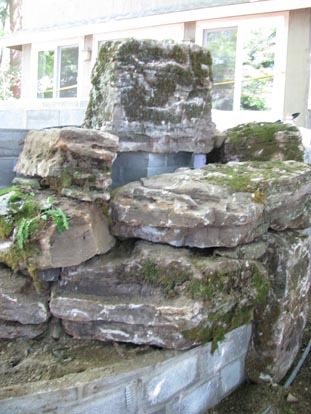 We offer our bluestone either cut or irregularly shaped. Our irregular flagstone patios and walkways are typically better suited in achieving a natural appearance and make an excellent option or alternative when considering manufactured paving blocks. 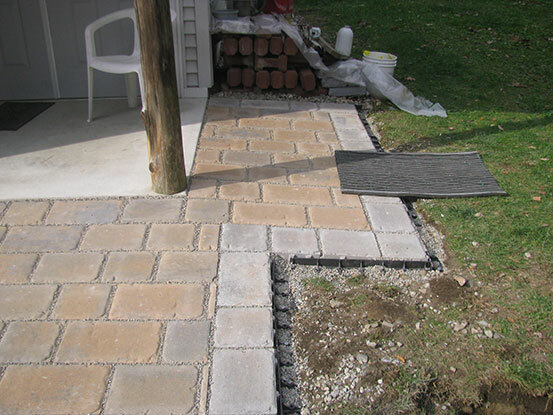 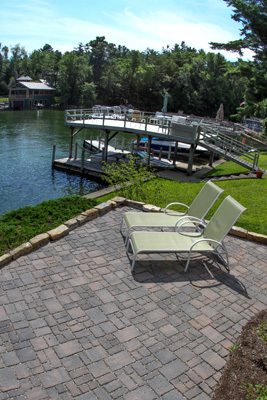 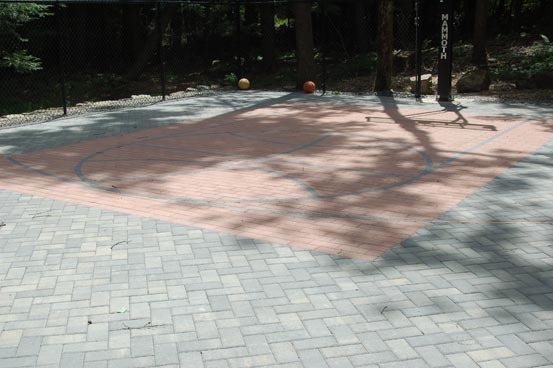 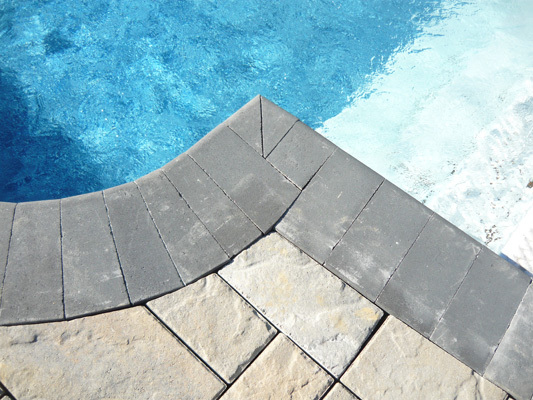 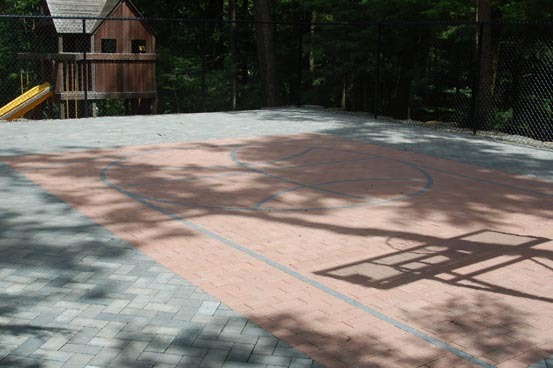 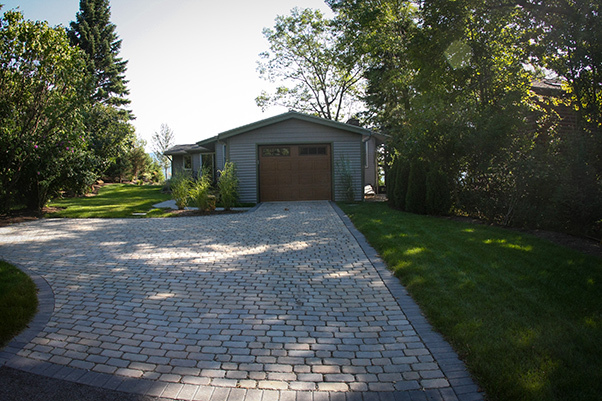 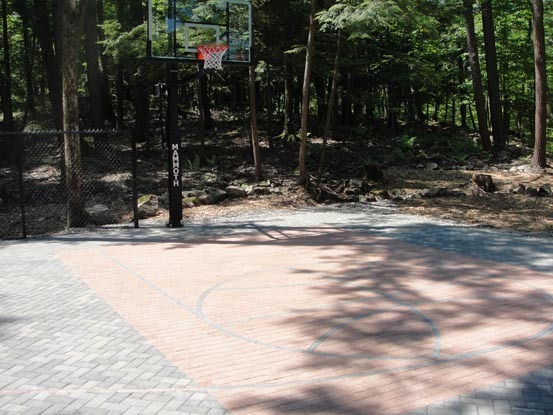 Similar to Pre-cast wall block in regards to its popularity and versatility, concrete pavers can be used for most any landscape environment, new or existing. 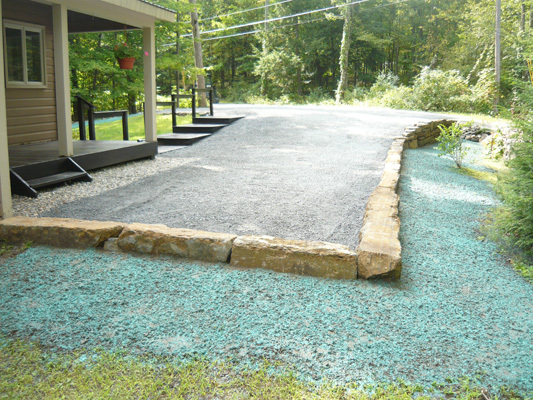 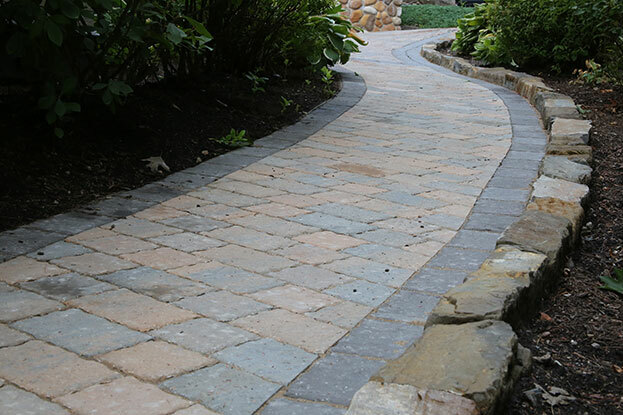 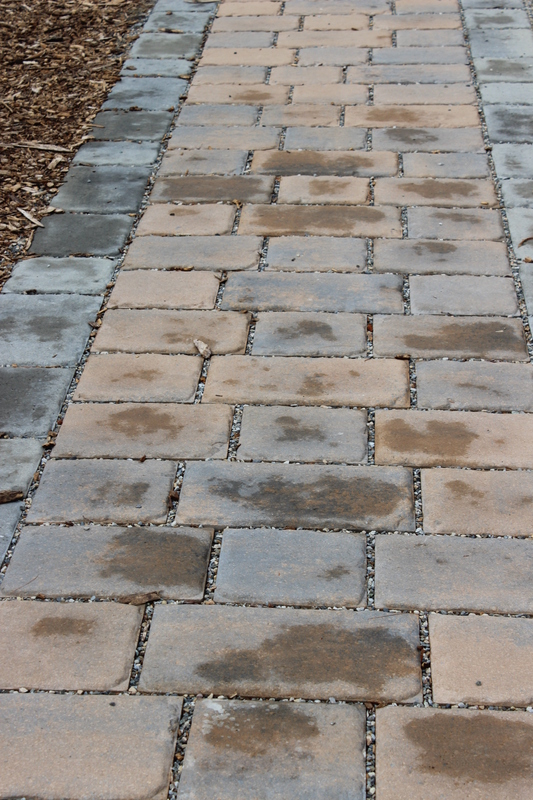 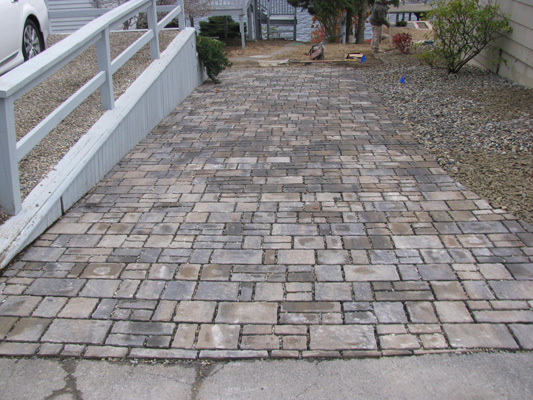 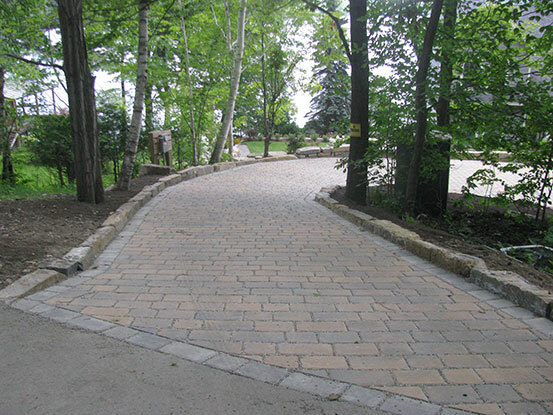 They can be used for walkways, patios, driveways or cart paths, and like the wall block, are available in numerous shapes, textures, and colors. 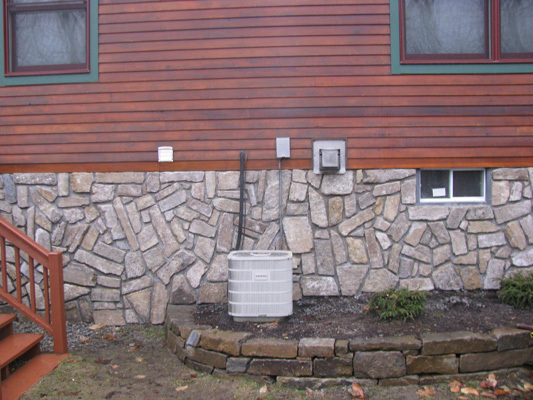 They also can be used to match different styles of pre-cast wall bock. 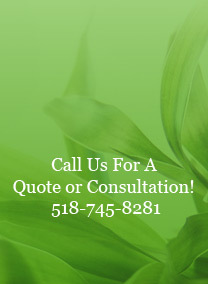 Website Design, Development and Hosting by Mannix Marketing Inc.